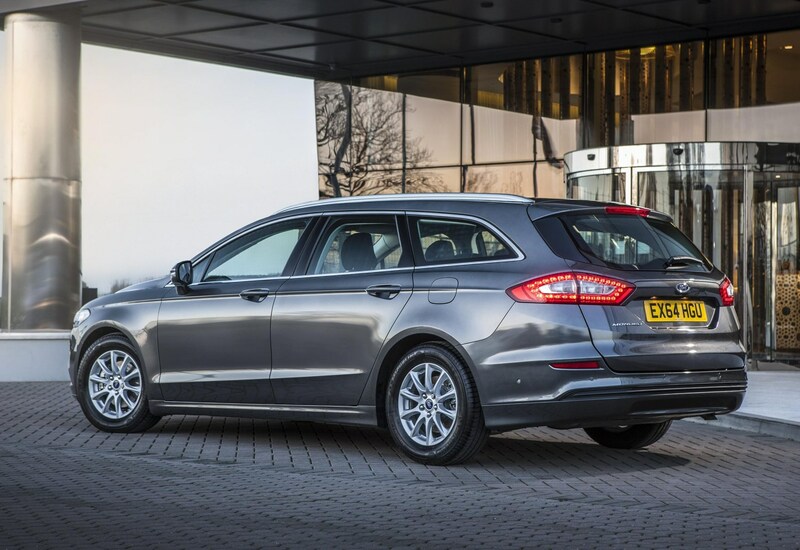 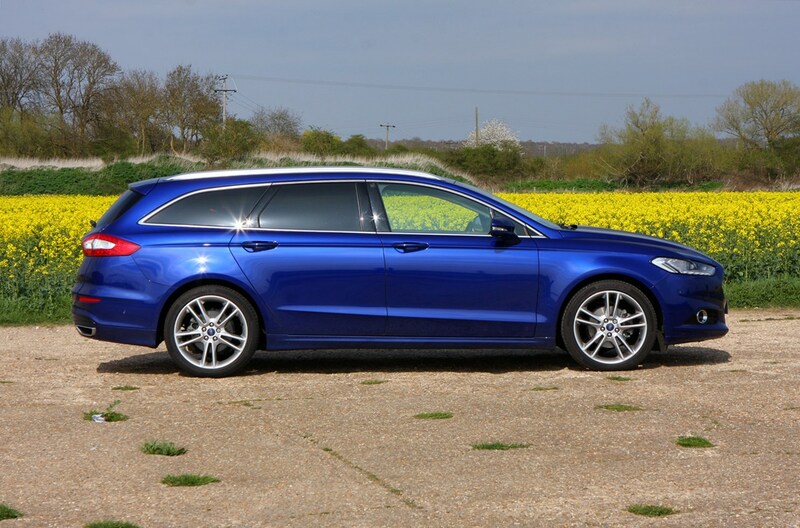 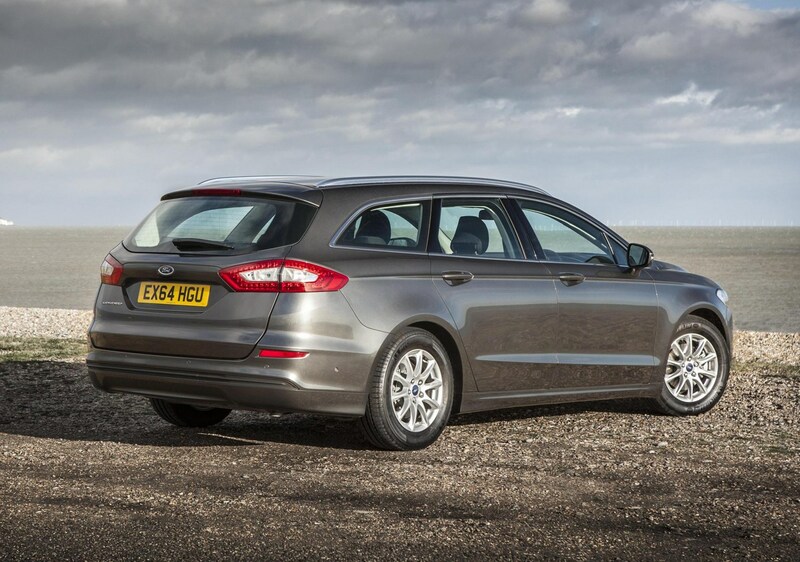 Like its hatchback and saloon counterparts, the Ford Mondeo Estate has the firm’s distinctive family face, but when compared with the latest Focus, you can see the design is beginning to feel its age. 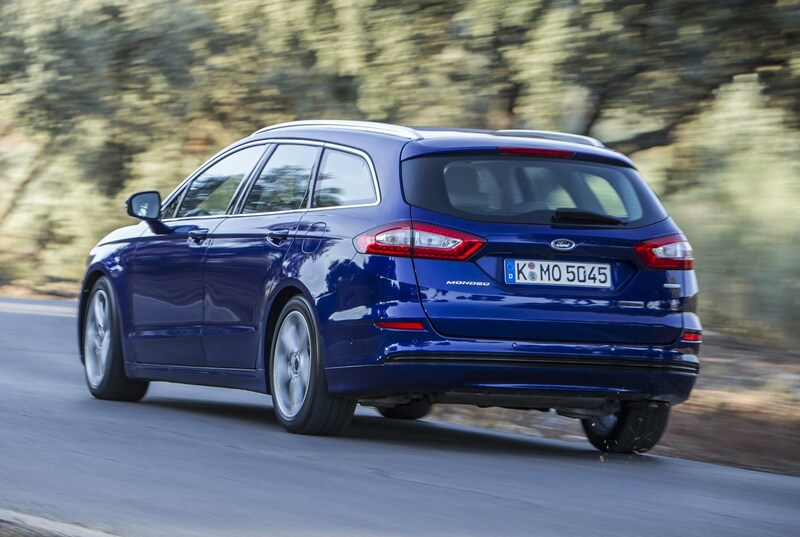 And that’s the case under the skin too, because Ford is just about to apply a major mid-life facelift to the Mondeo line-up, so the car you’re looking at here has several years under its belt. 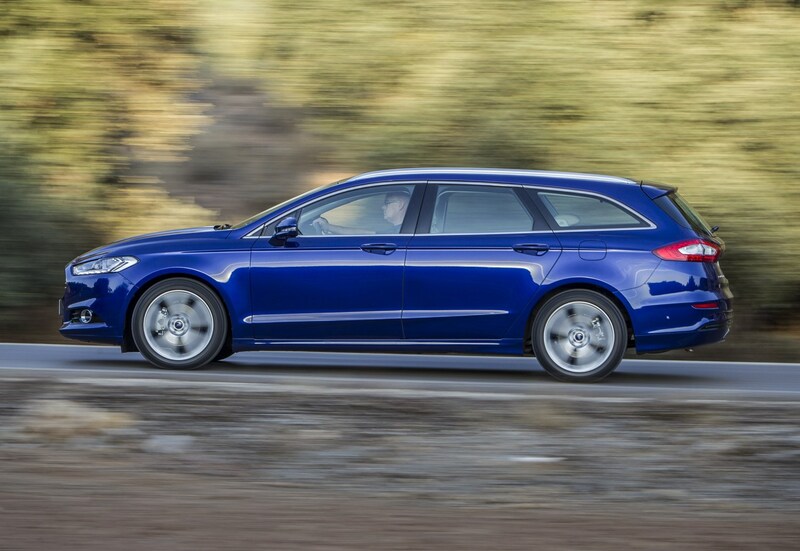 Its main competition comes in the form of the VW Passat Estate, the Vauxhall Insignia Grand Sport, Skoda Superb Estate and Mazda 6 Estate – cars that offer huge bootspace, low costs and a comfortable long-distance drive. 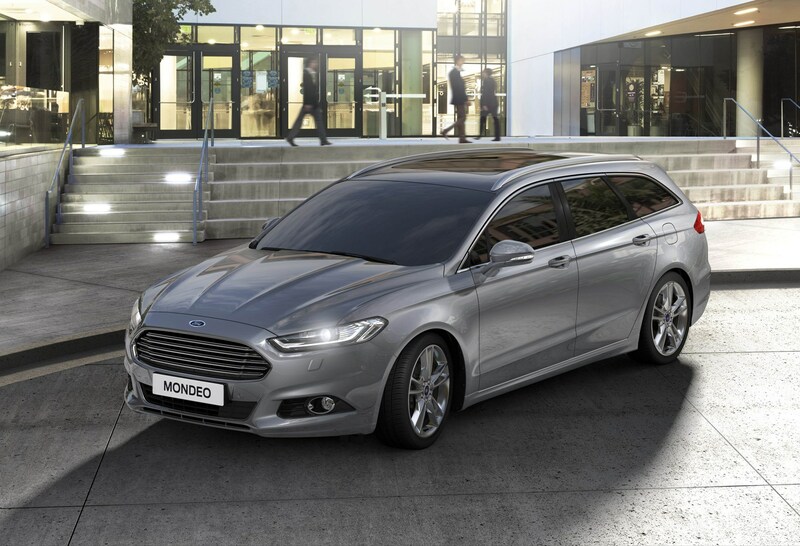 At the Brussels motor show in 2019, Ford revealed the updated Mondeo family to the public. 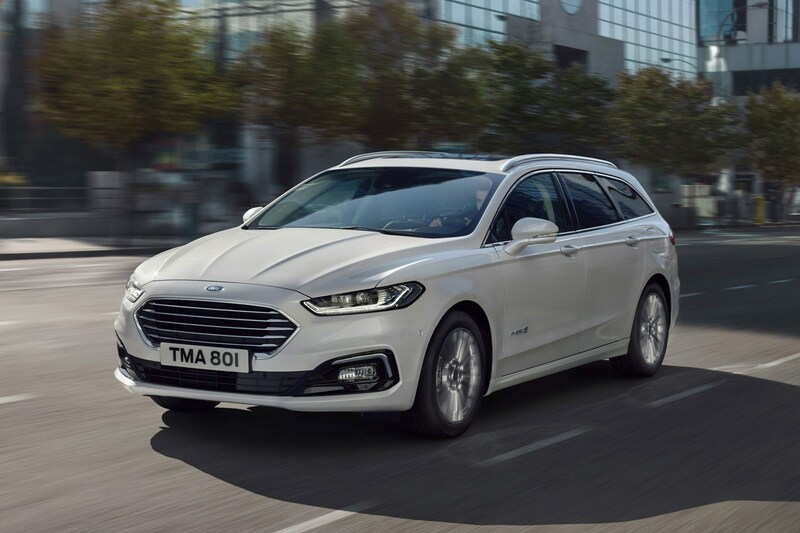 Already on sale in the USA as the Fusion, this latest iteration adds valuable extra engine technology into the mix in the form of a Hybrid powertrain for the Estate. 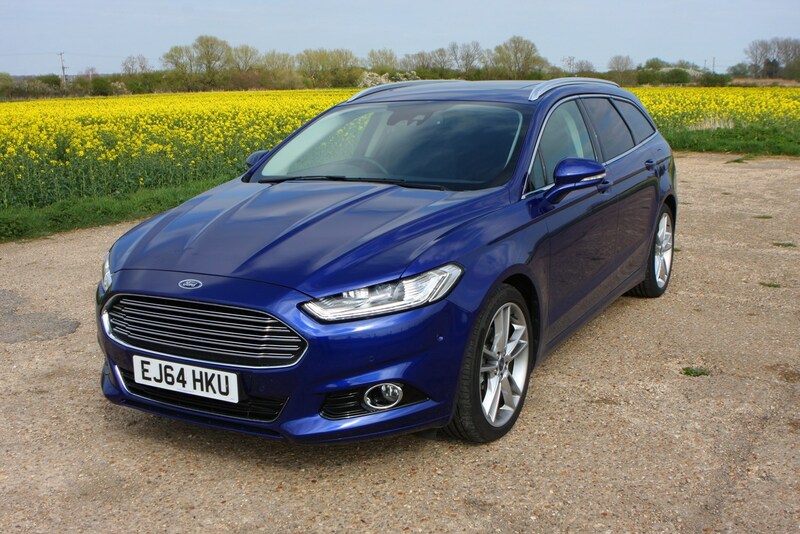 The Mondeo Saloon was available with a hybrid driveline before, but its relatively unpopular bodystyle and rudimentary technology meant it wasn’t particularly popular. 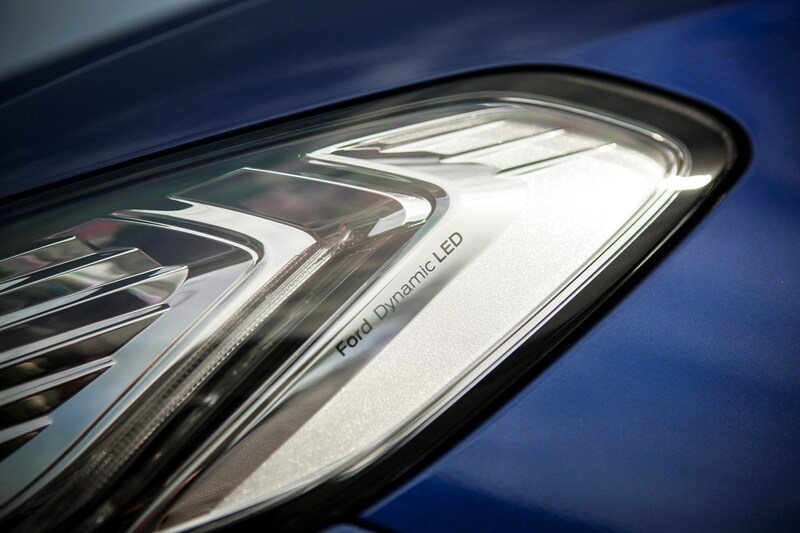 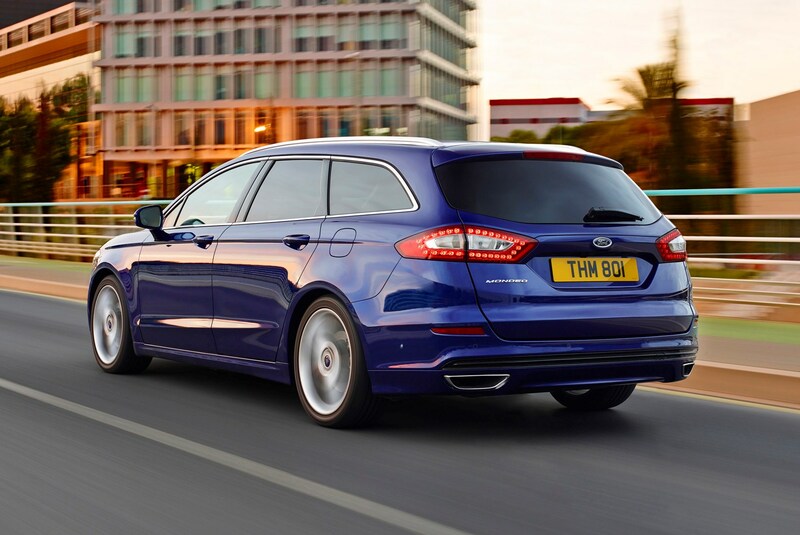 This new hybrid uses the same technology, albeit optimised for much better efficiency. 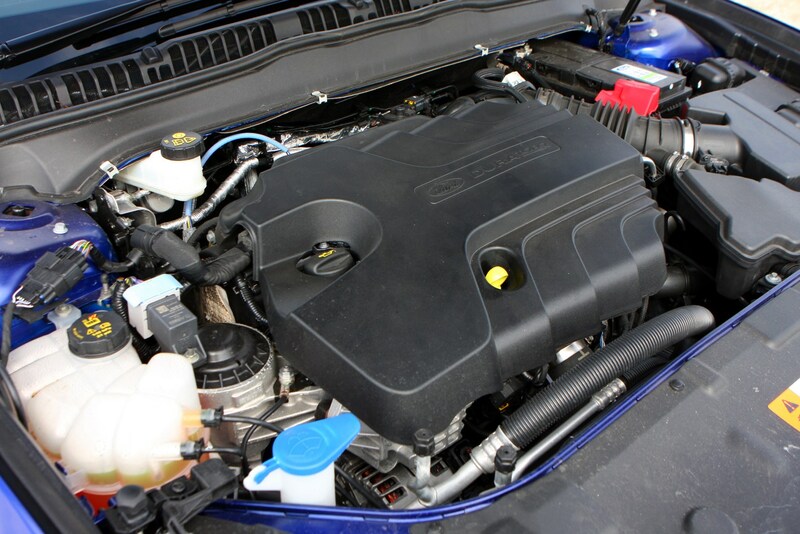 That means it’s a 2.0-litre petrol engine coupled to an electric motor, which is fed by a 1.4kWh battery. 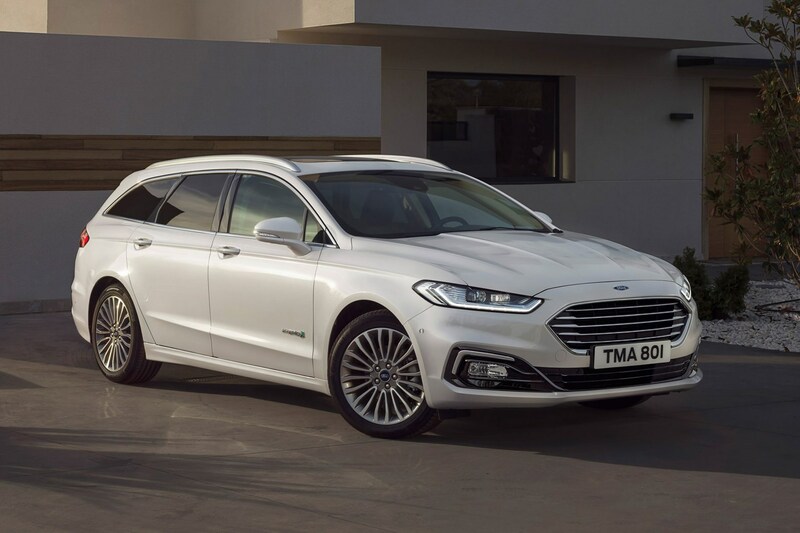 Total output is 187hp, and Ford claims it’ll emit CO2 at a rate of 101g/km in some configurations, meaning relatively low tax bills for private and business drivers. 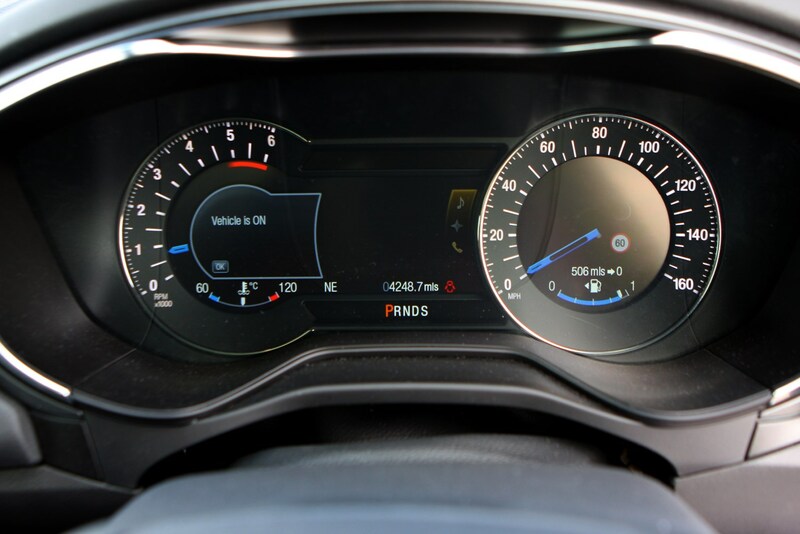 Fuel economy is quoted as 64.2mpg. 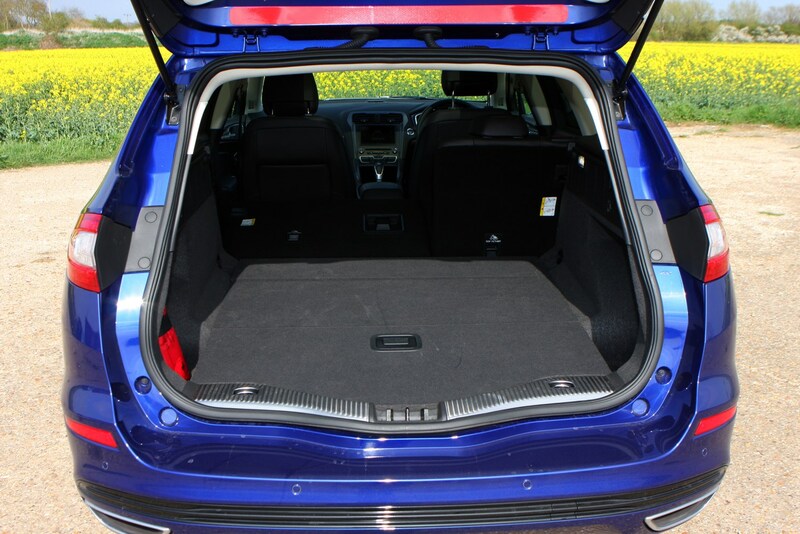 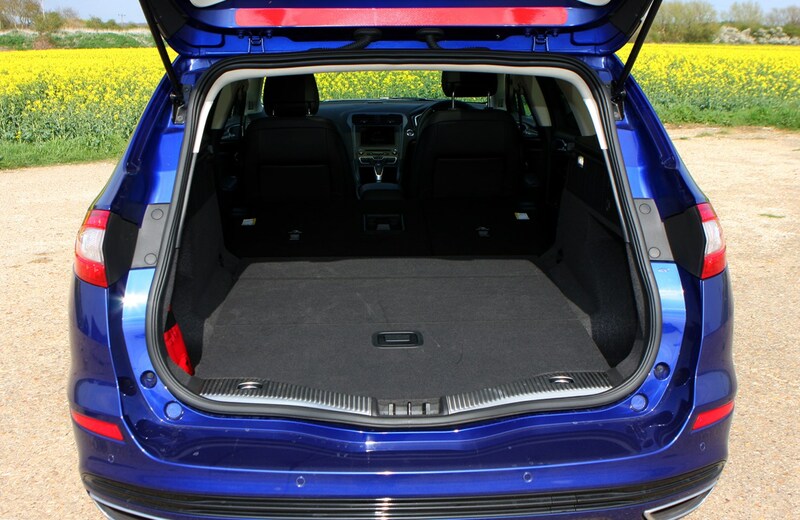 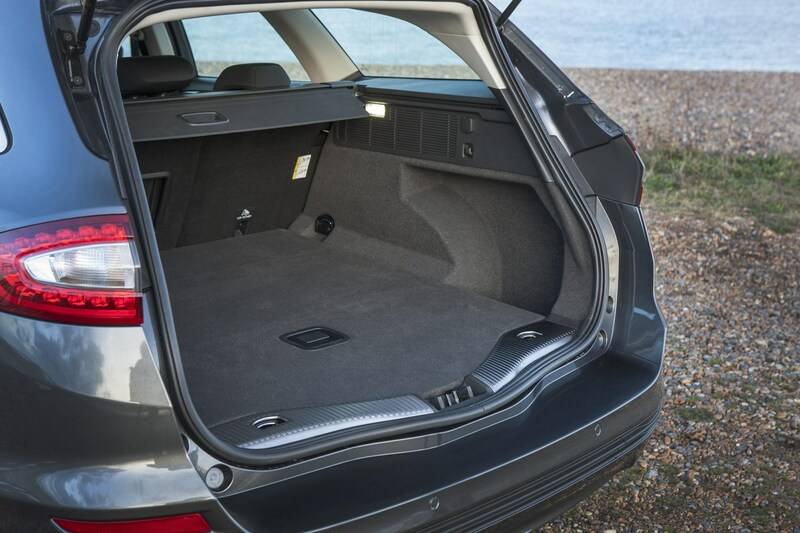 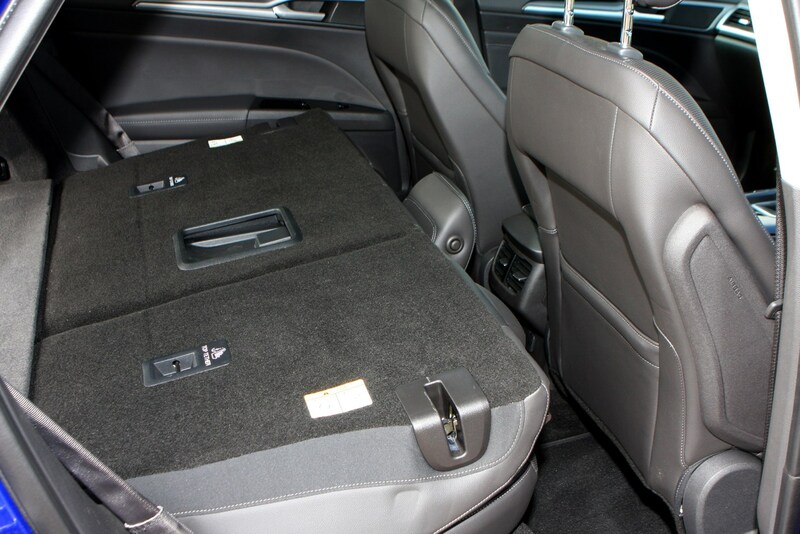 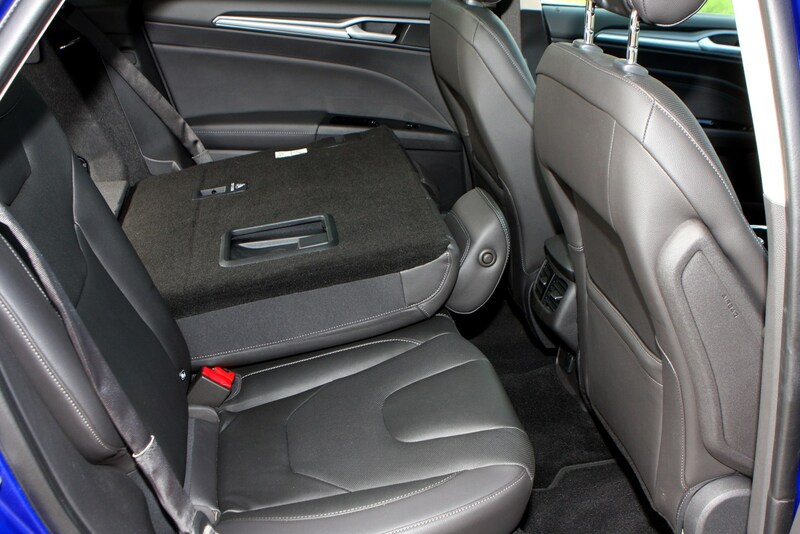 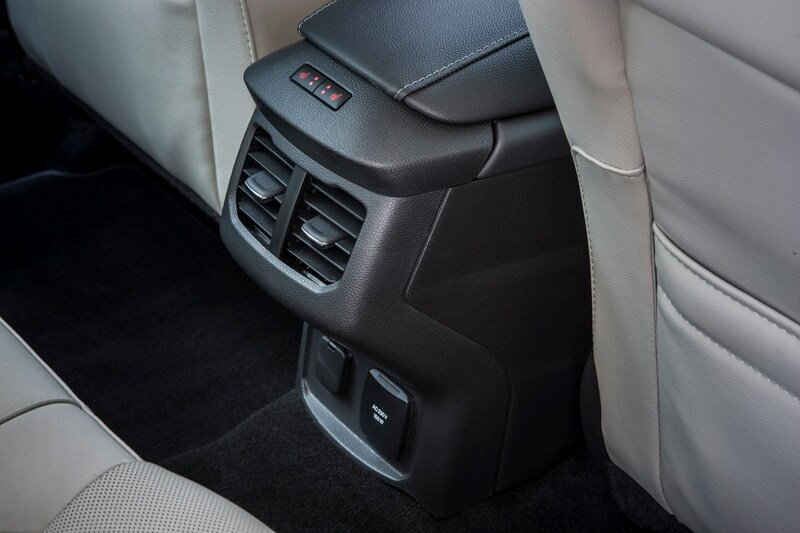 You pay a small bootspace penalty for picking the Hybrid, with 403 litres behind the rear seats. 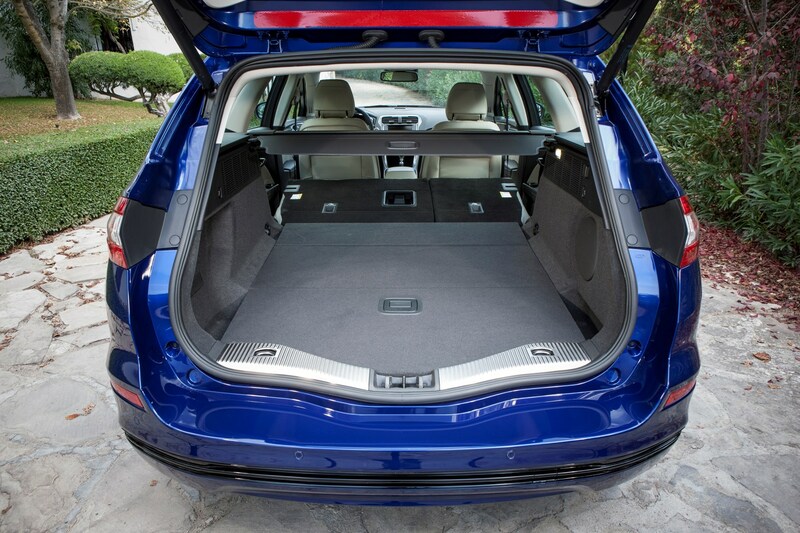 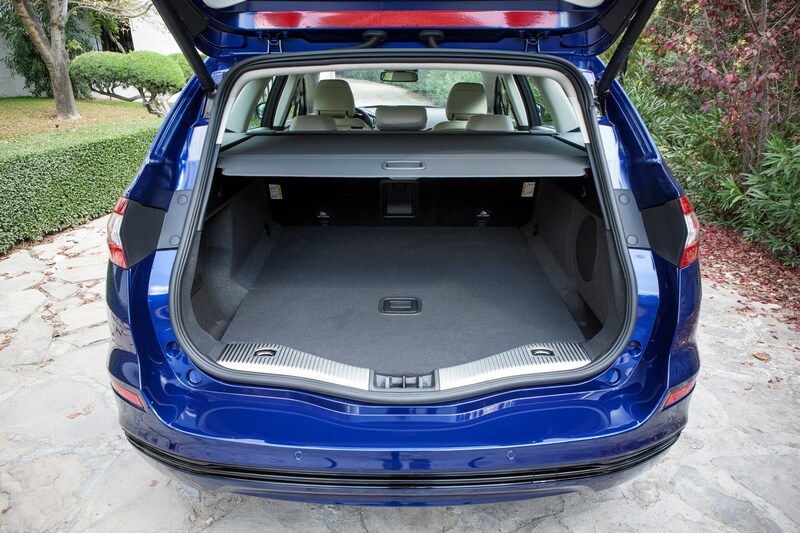 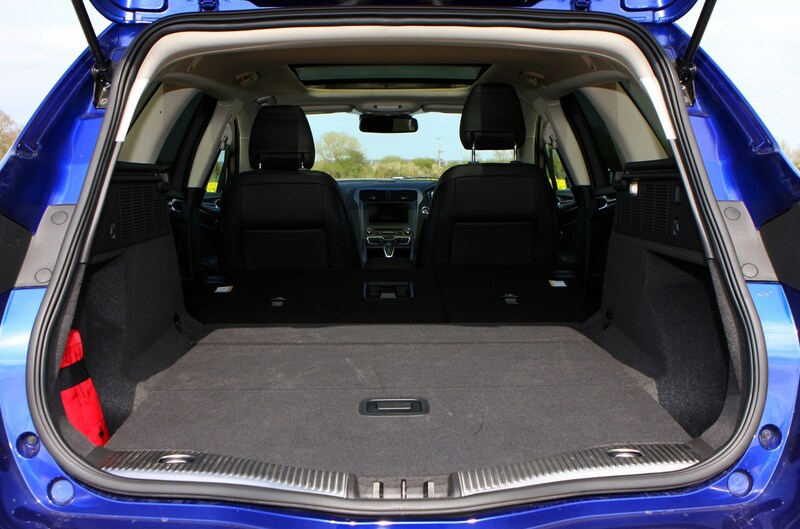 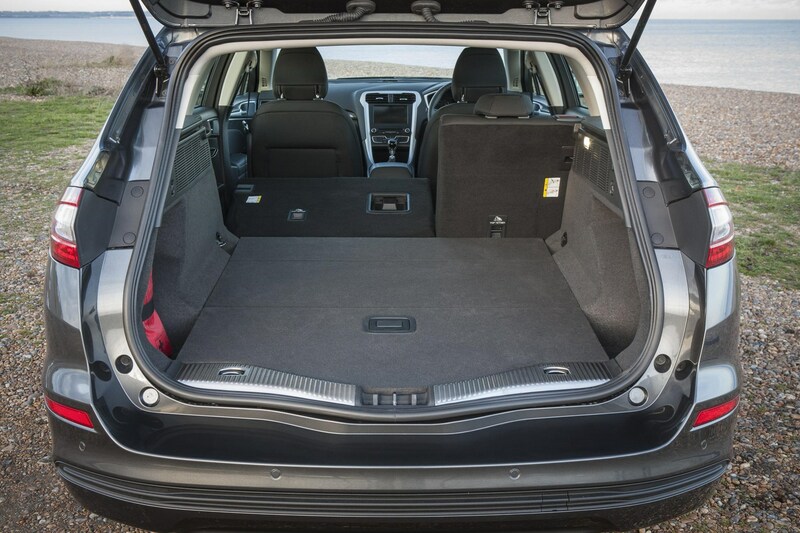 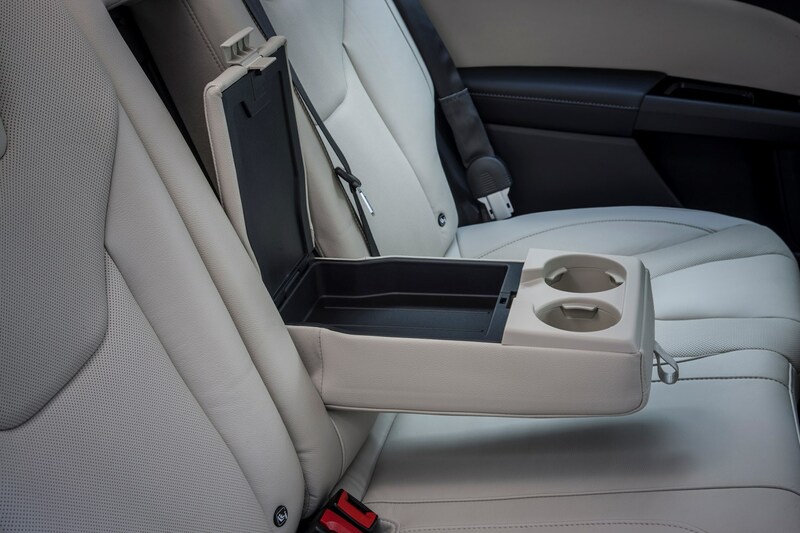 Fold those perches away and you get a flat floor and 1,508 litres of luggage capacity. 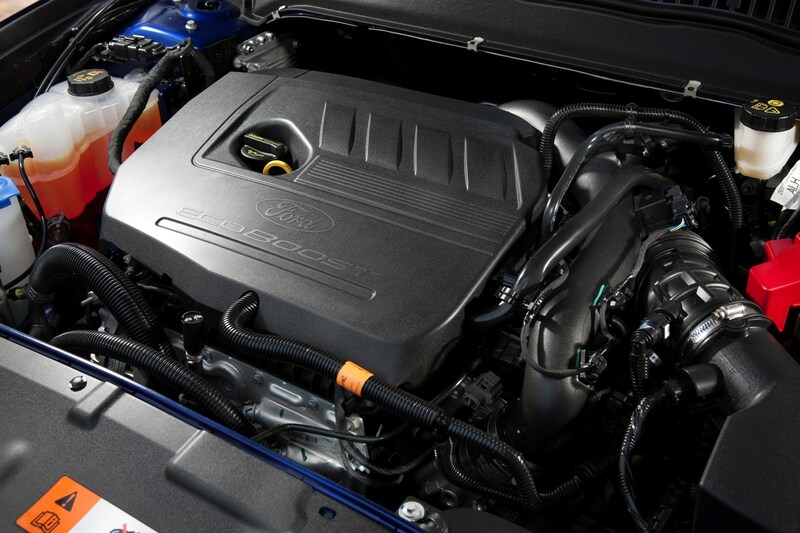 But Ford doesn’t think diesel’s dead just yet either, and has introduced a 2.0-litre EcoBlue motor with three power outputs – 120hp, 150hp and 190hp – with CO2 emissions of 117, 118 and 130g/km respectively. 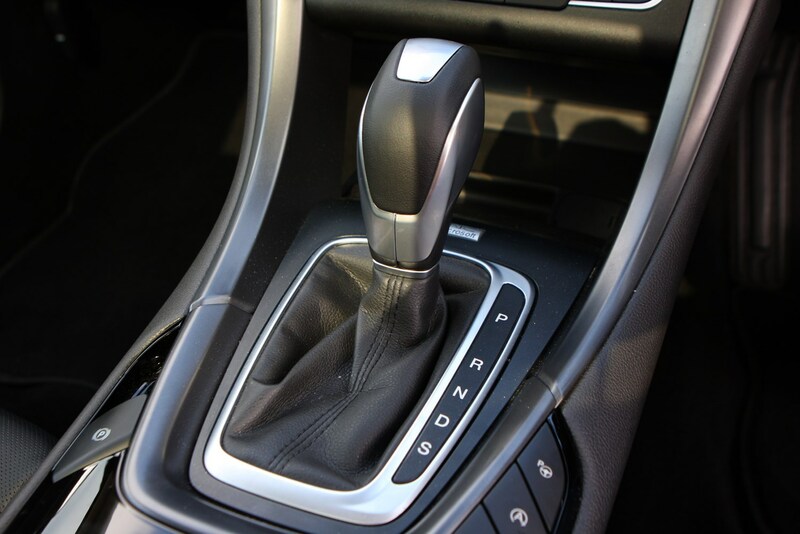 A new eight-speed automatic gearbox is available alongside a six-speed manual, while an all-wheel drive system will also be offered. 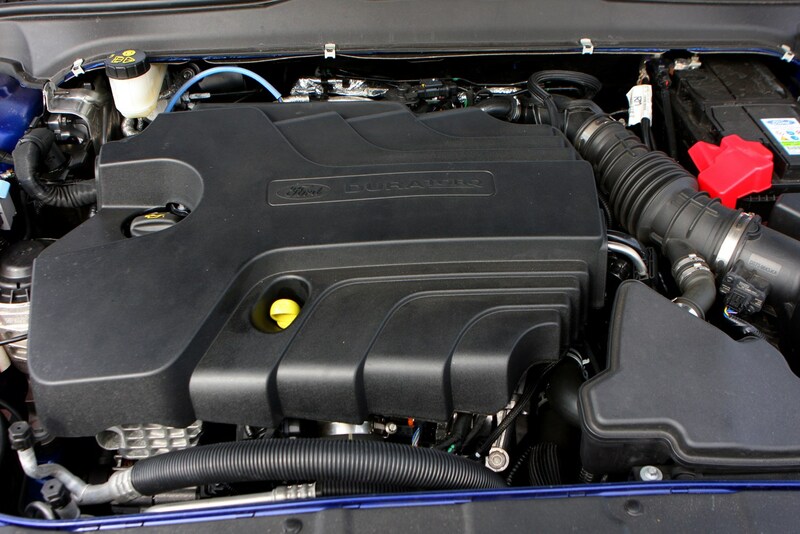 A 1.5-litre, 165hp petrol engine remains available from pre-facelift cars. 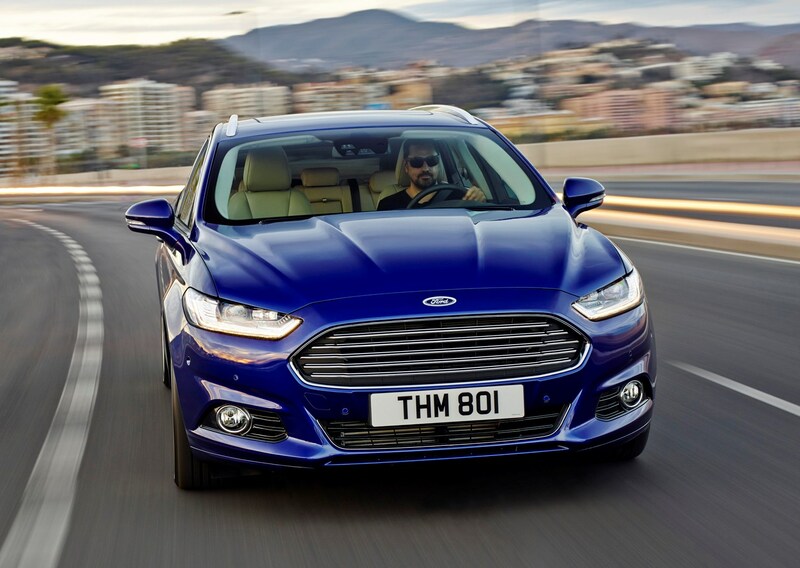 Other changes include design tweaks inside and out, with the objective of adding more differentiation between Titanium, ST-Line and Vignale trim levels, while there’s extra driver-assistance tech in the form of adaptive cruise control, a traffic sign-reading speed limiter and lane-departure prevention. 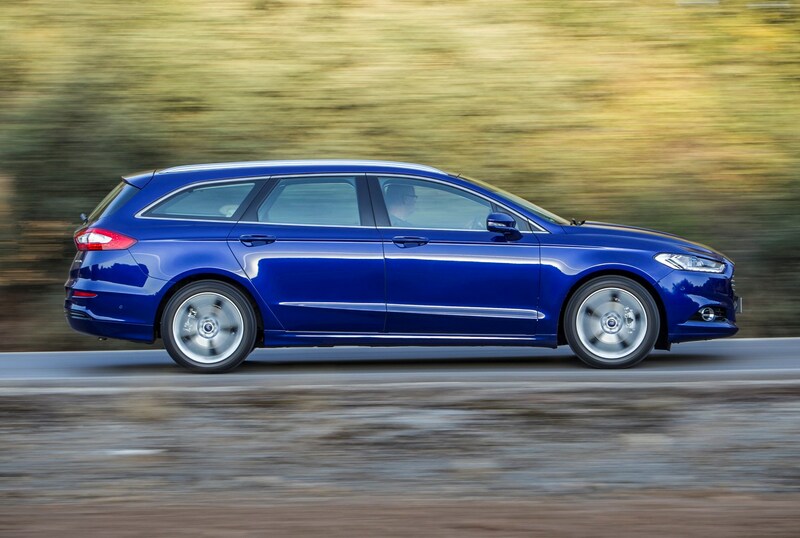 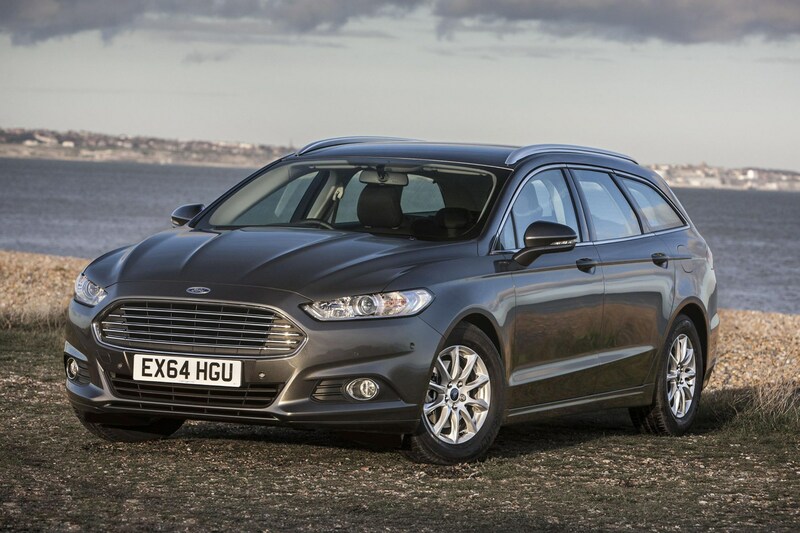 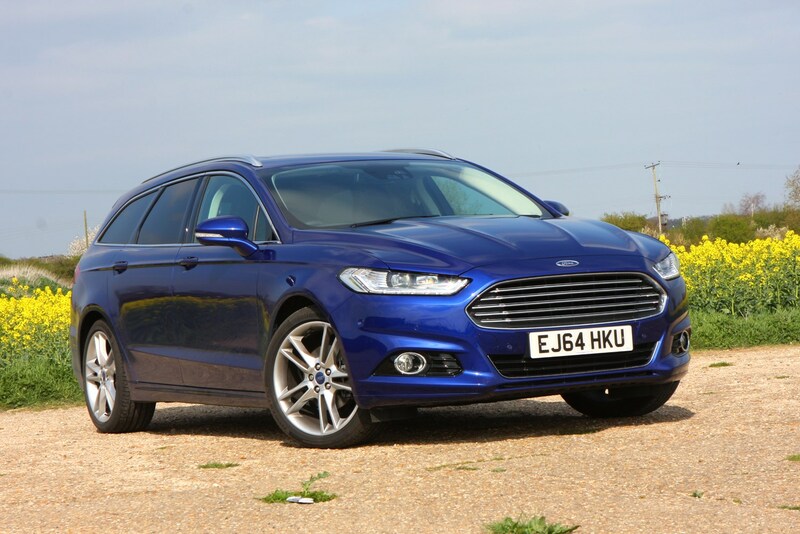 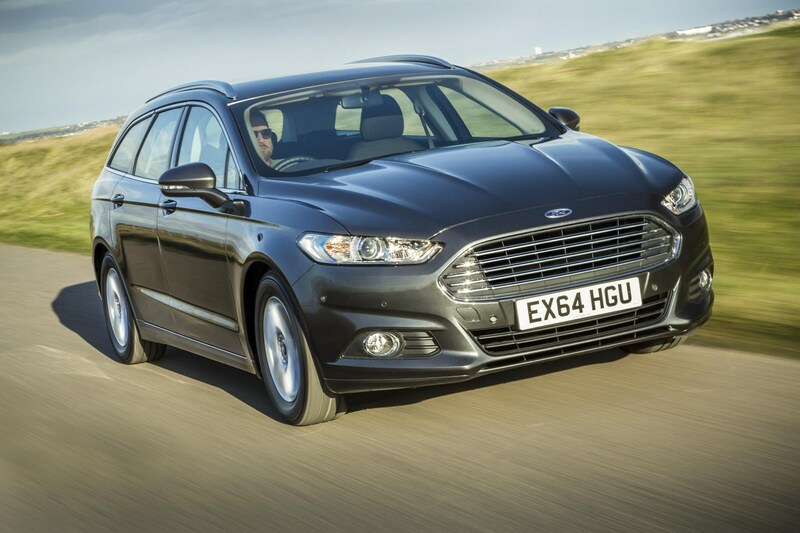 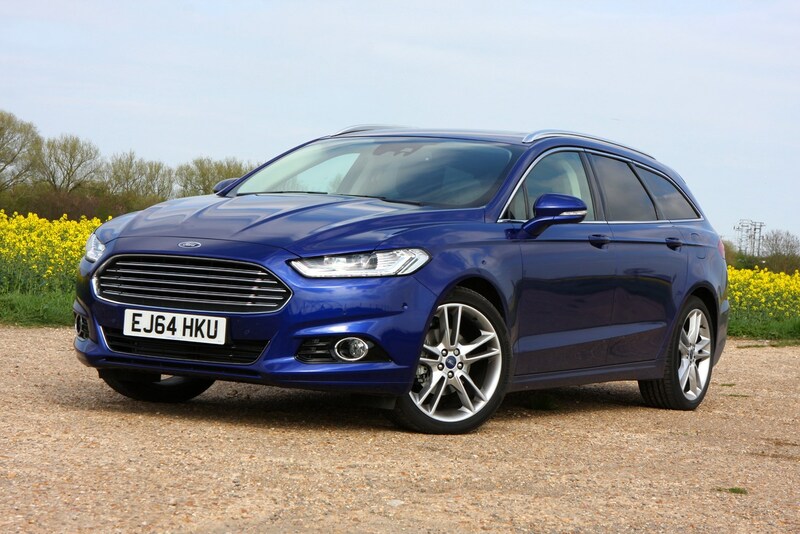 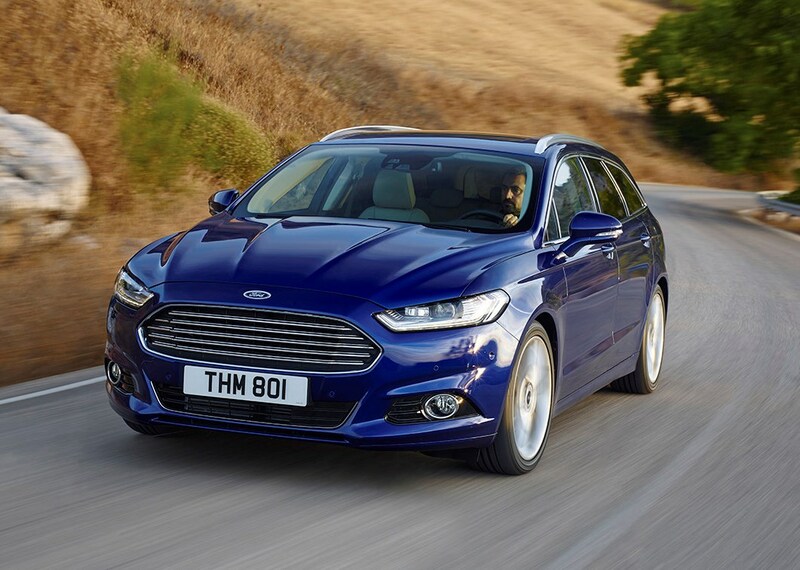 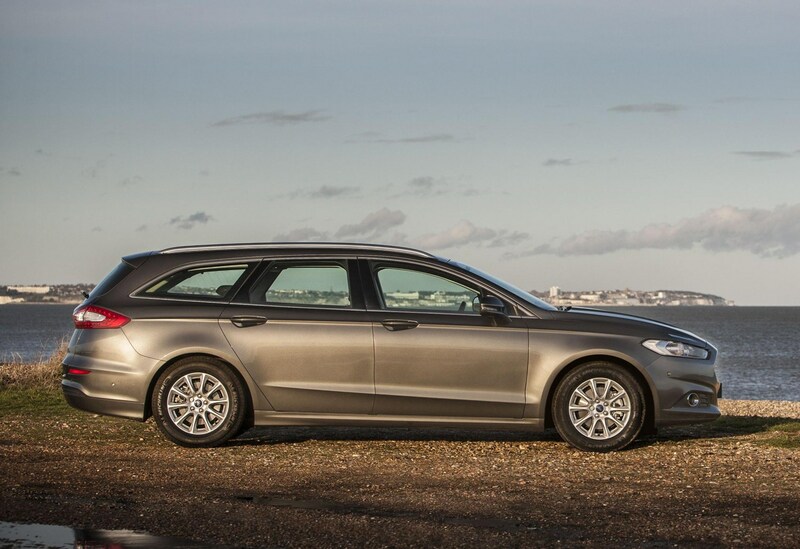 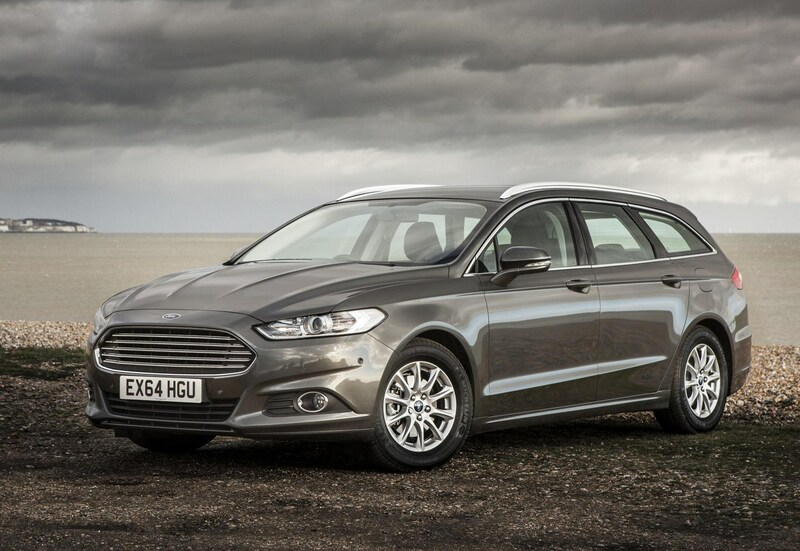 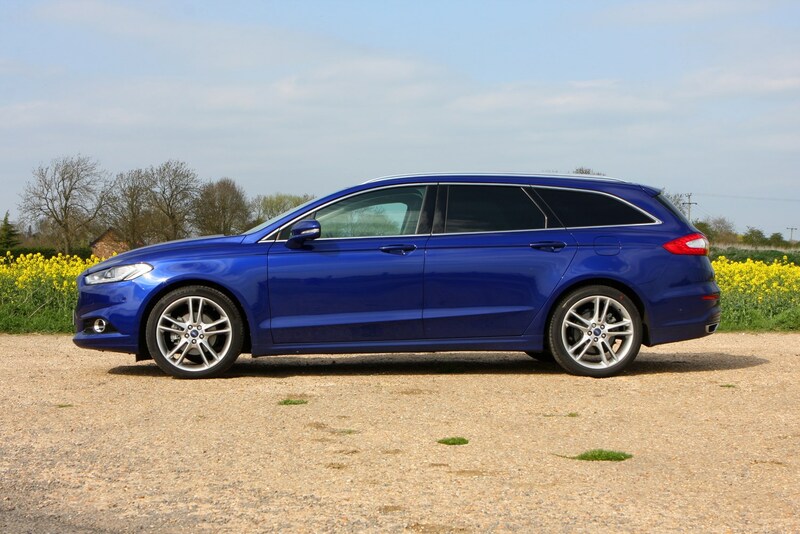 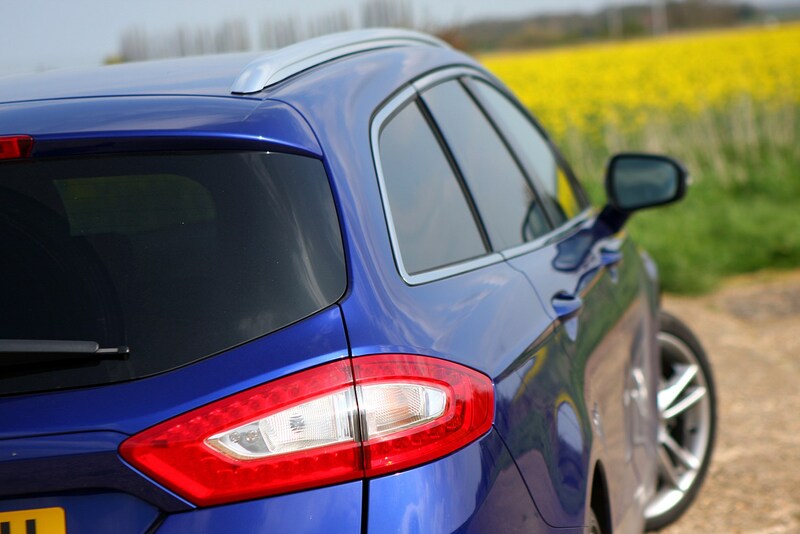 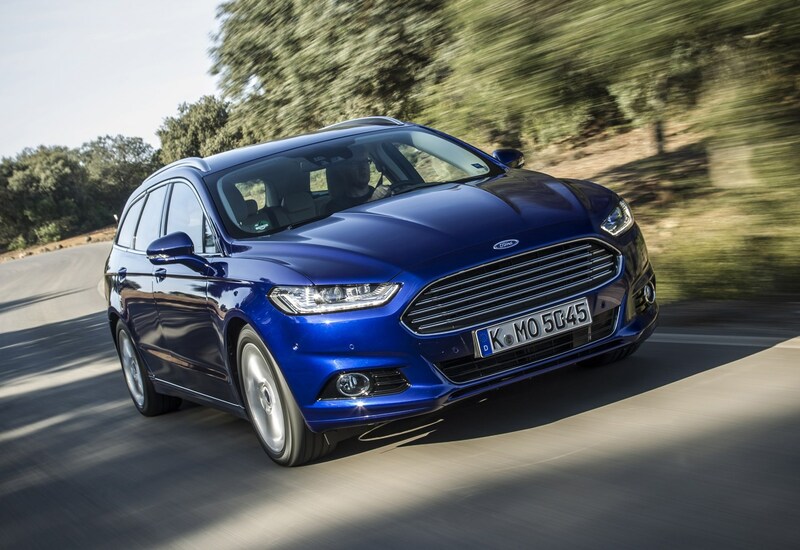 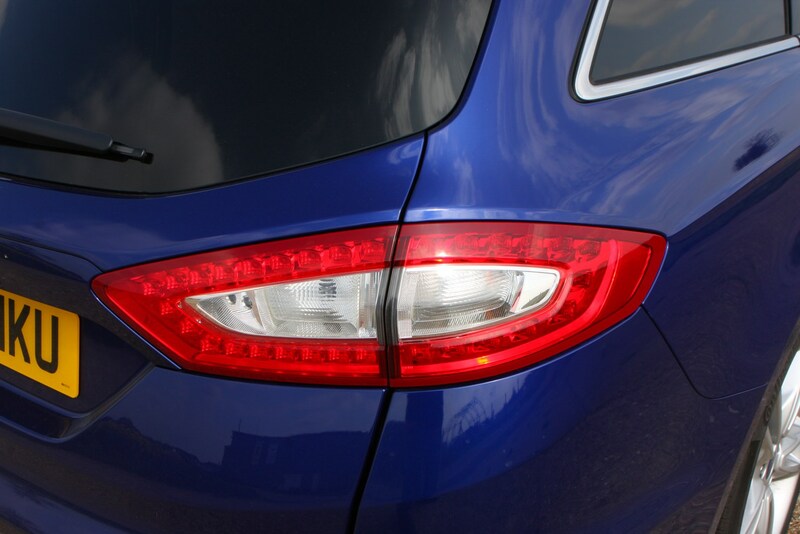 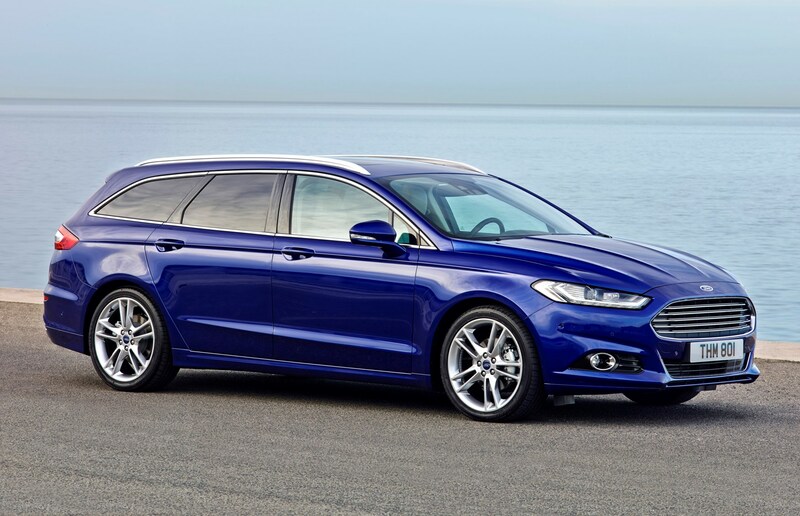 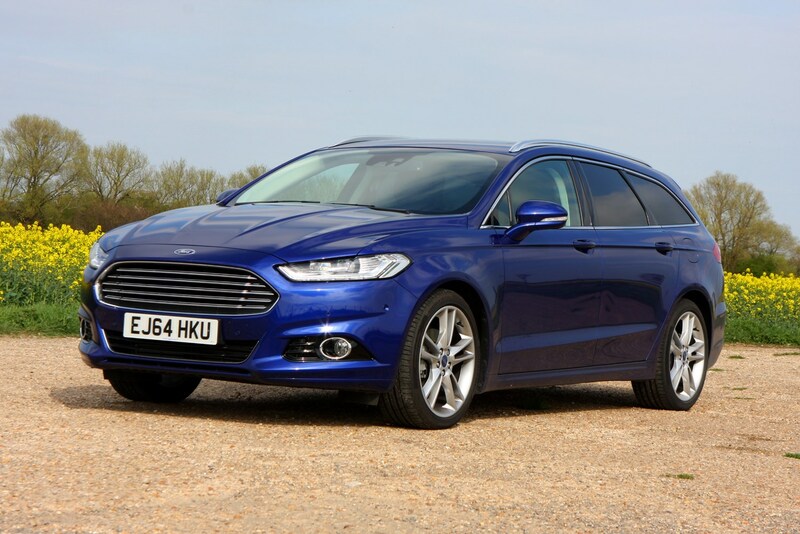 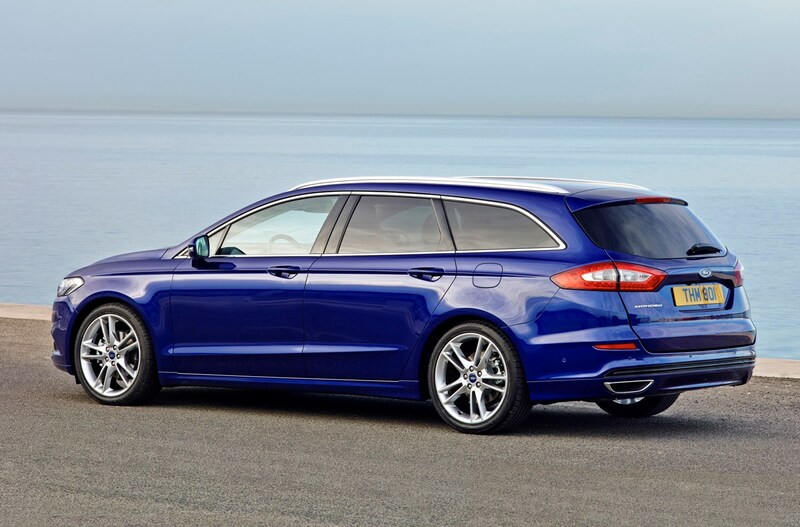 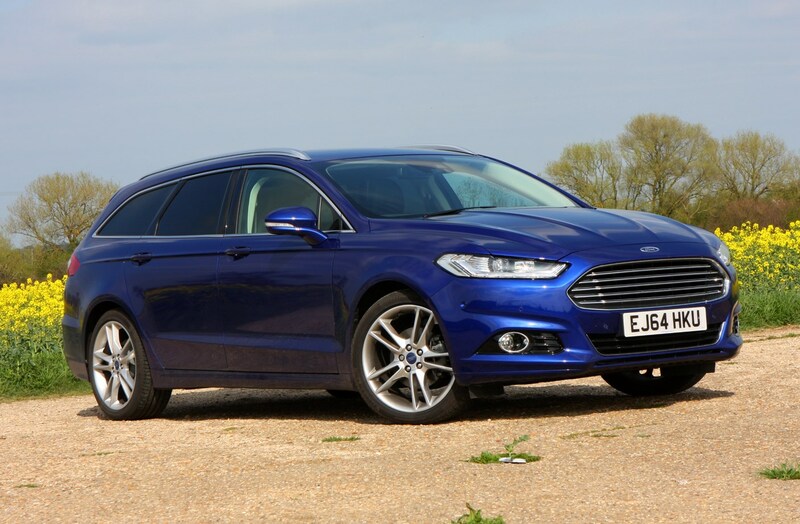 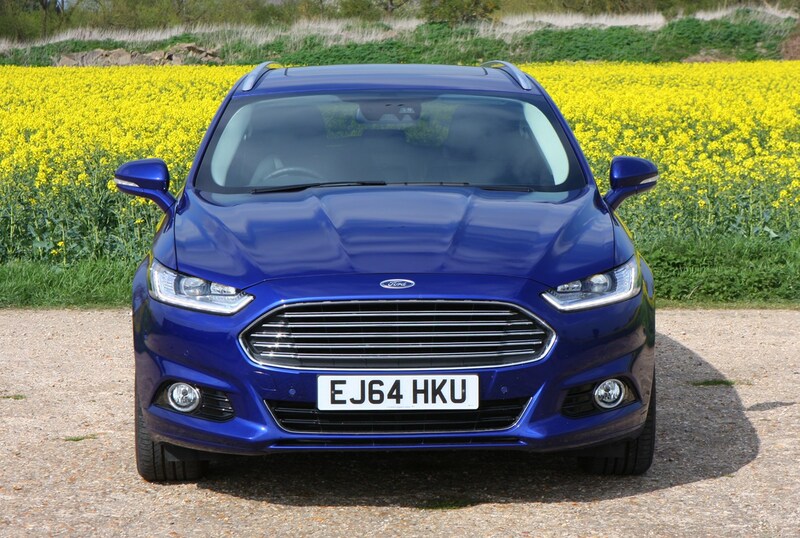 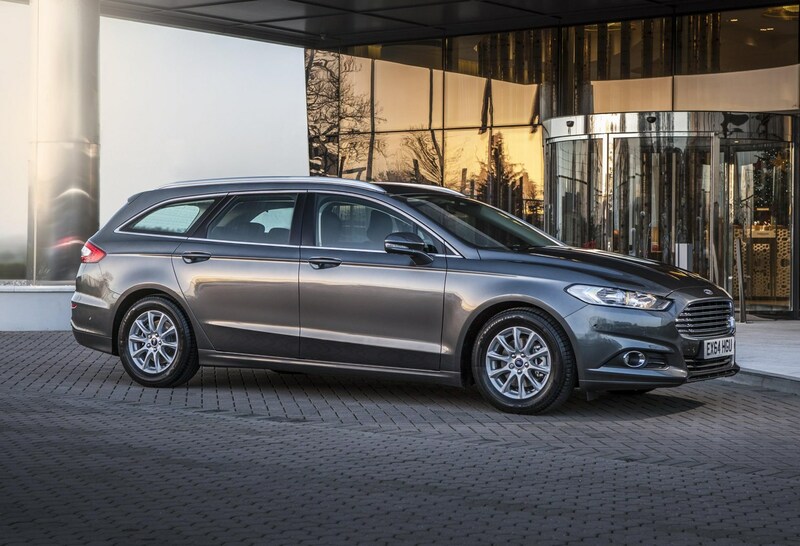 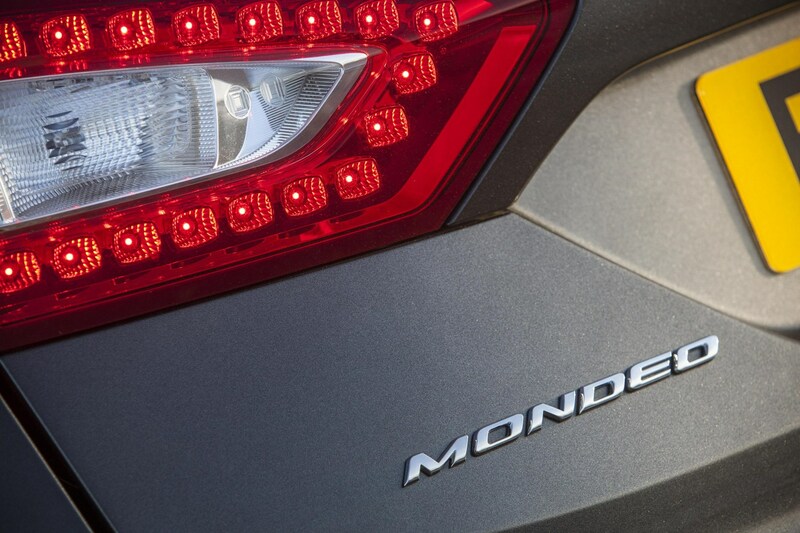 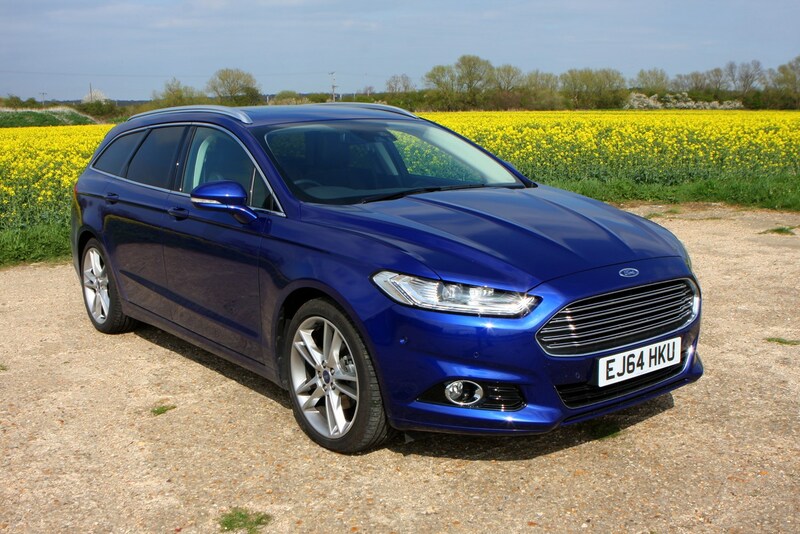 What’s the 2014-on Ford Mondeo Estate like? 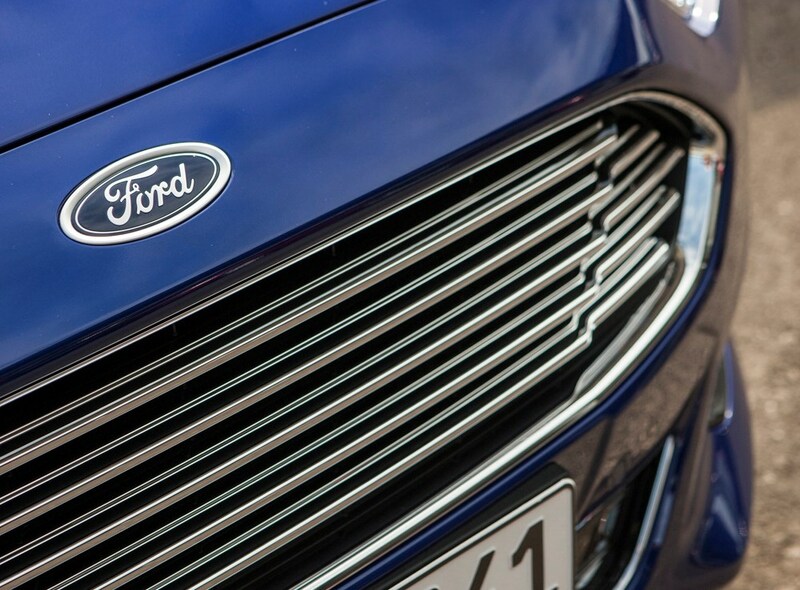 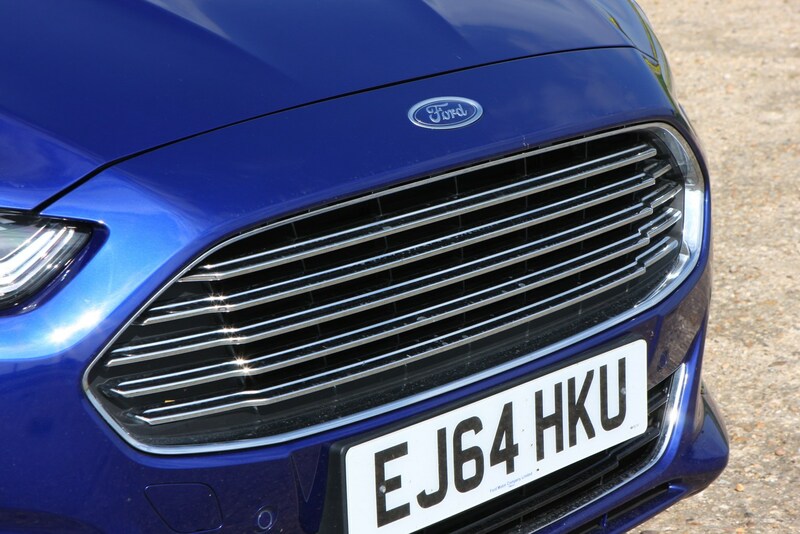 Ford’s trademark grille and slender headlamps dominate the front, sculpted sides emphasise the length and a wide tail helps it accommodate larger loads. 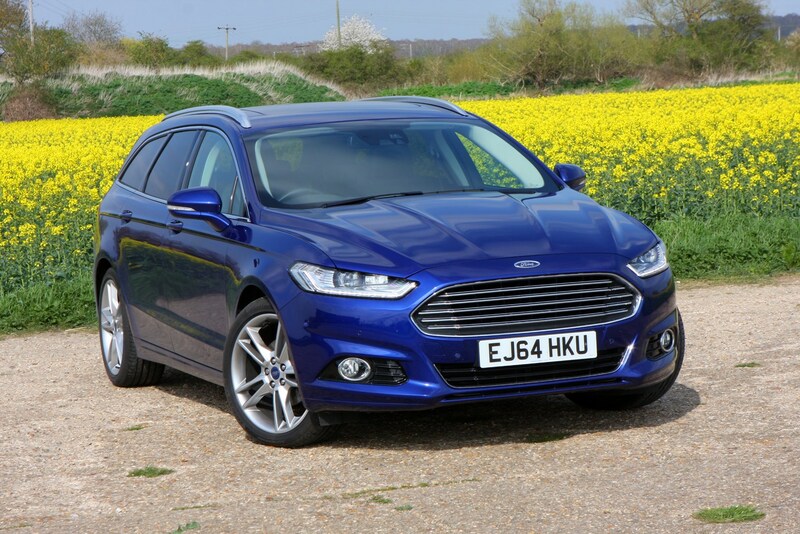 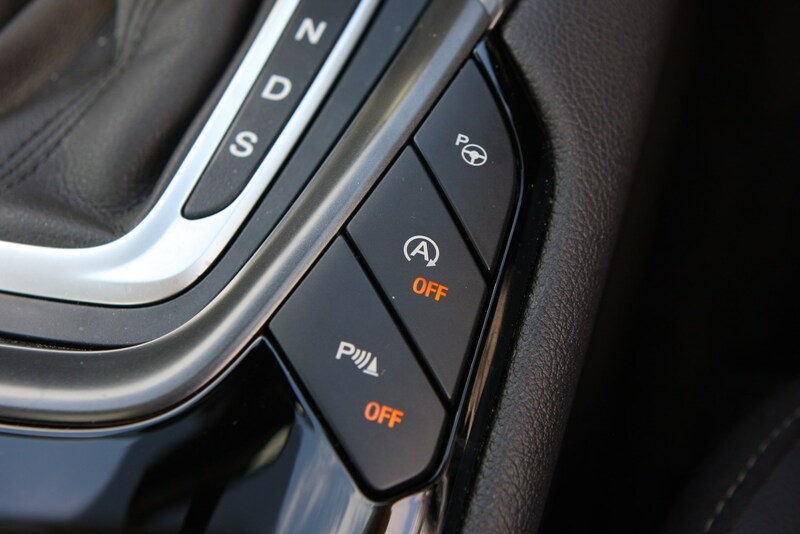 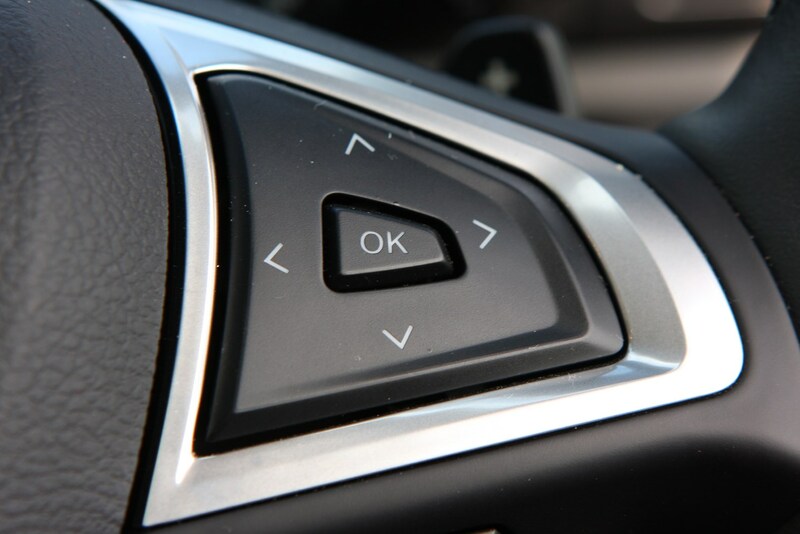 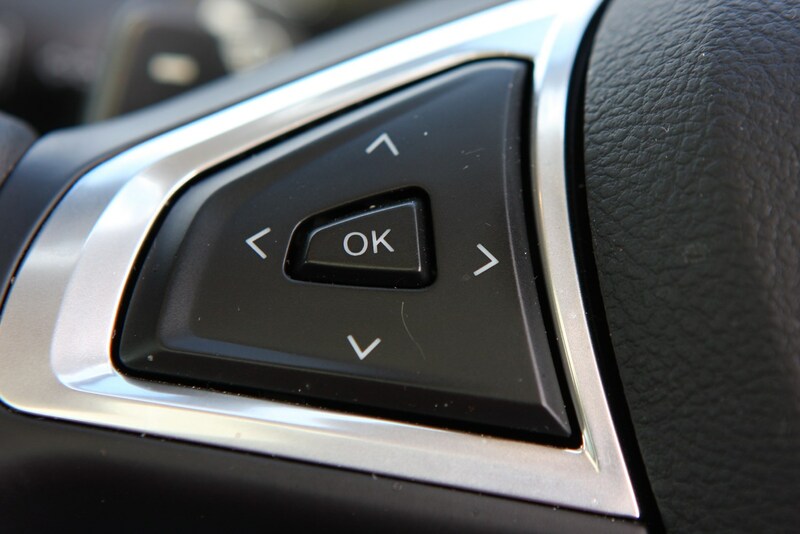 When launched there was a lot of advanced technology introduced in to the Mondeo, but much of it – including safety equipment – is optional. 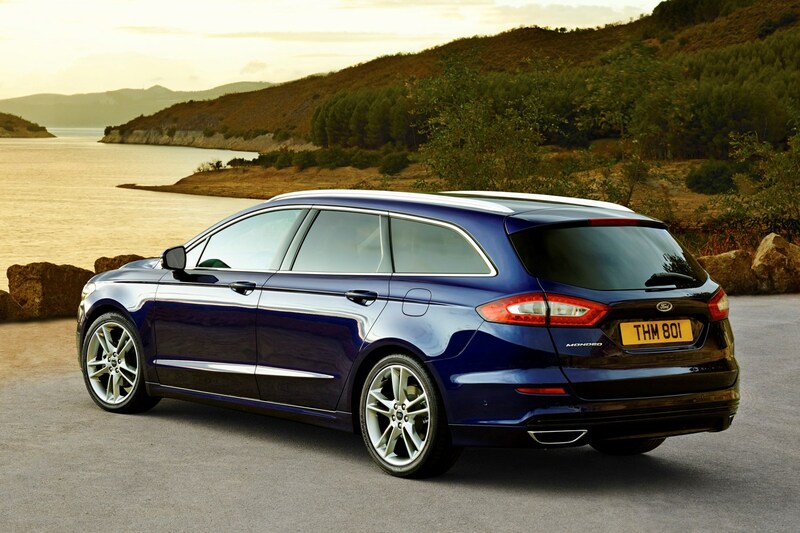 That raft of safety measures includes the European introduction on a Ford of rear inflatable seatbelts. 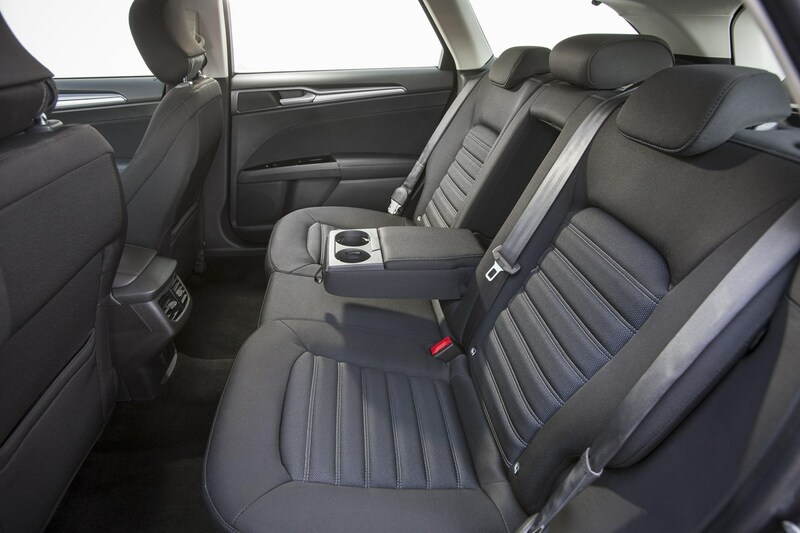 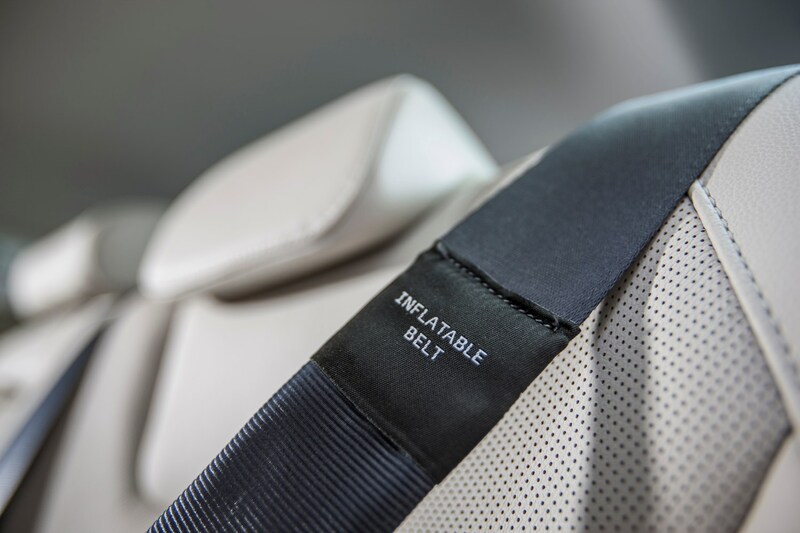 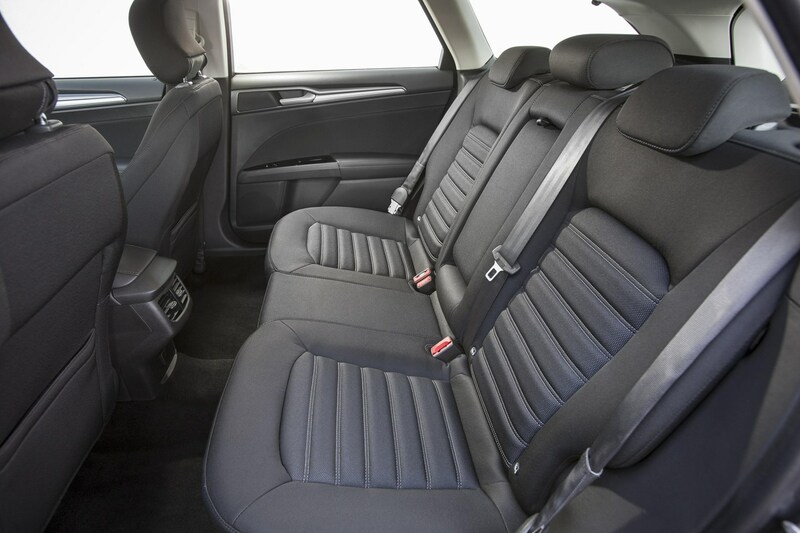 Fitted to the two outer rear seat positions, the seatbelts balloon to increase the surface area across the wearer’s chest five-fold for improved protection. 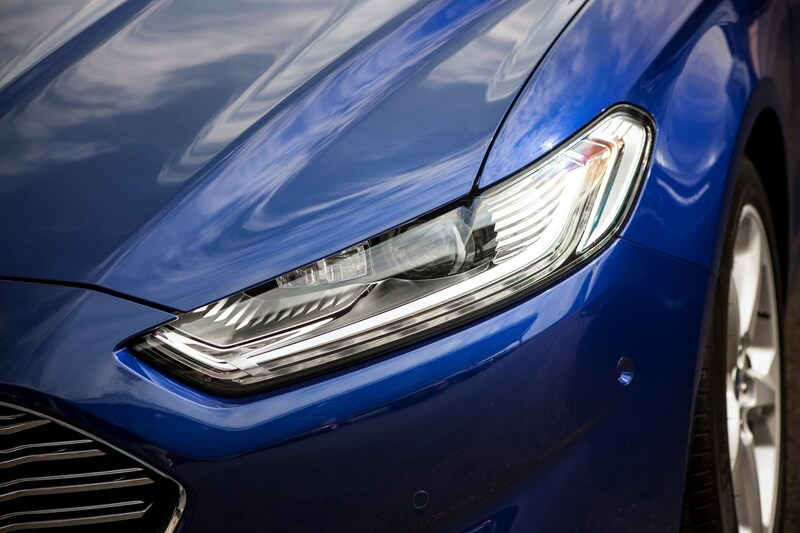 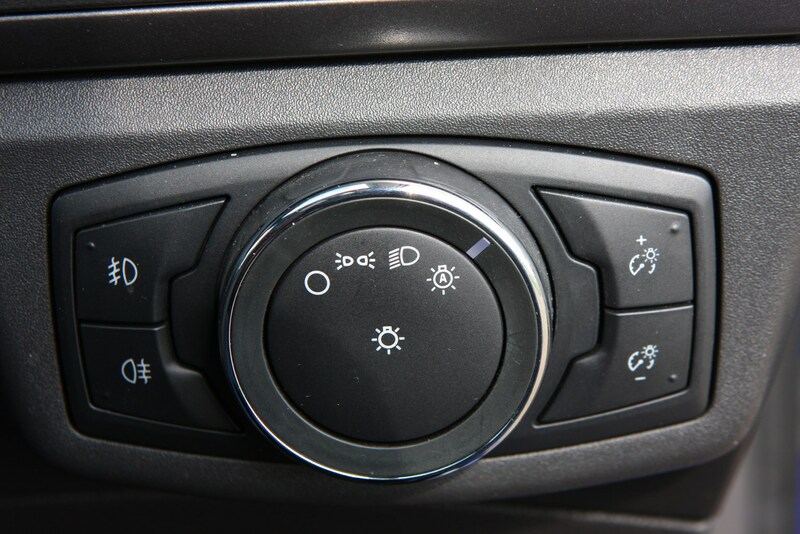 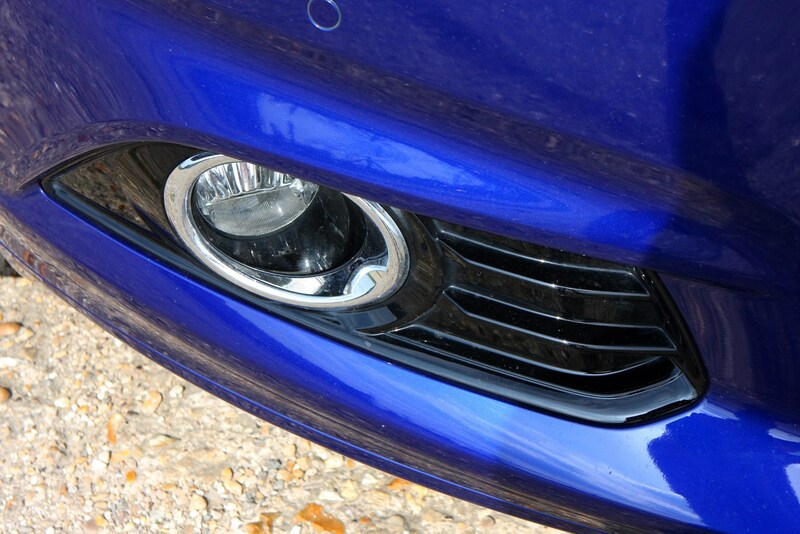 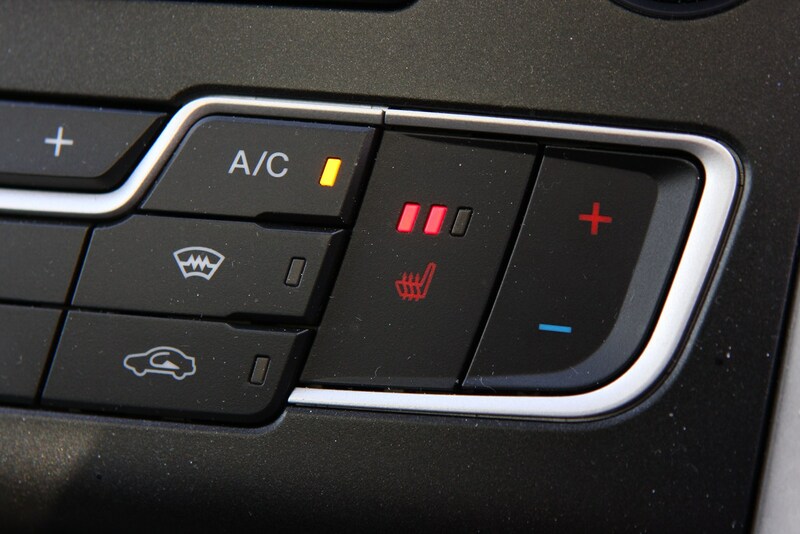 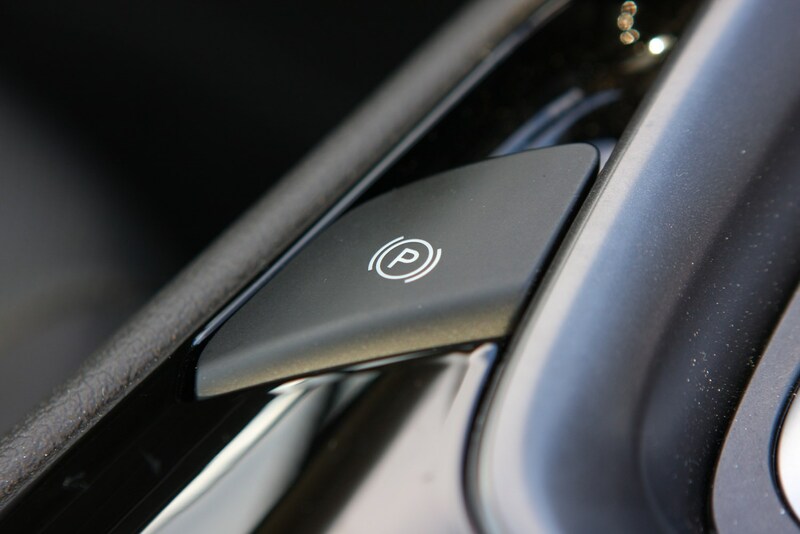 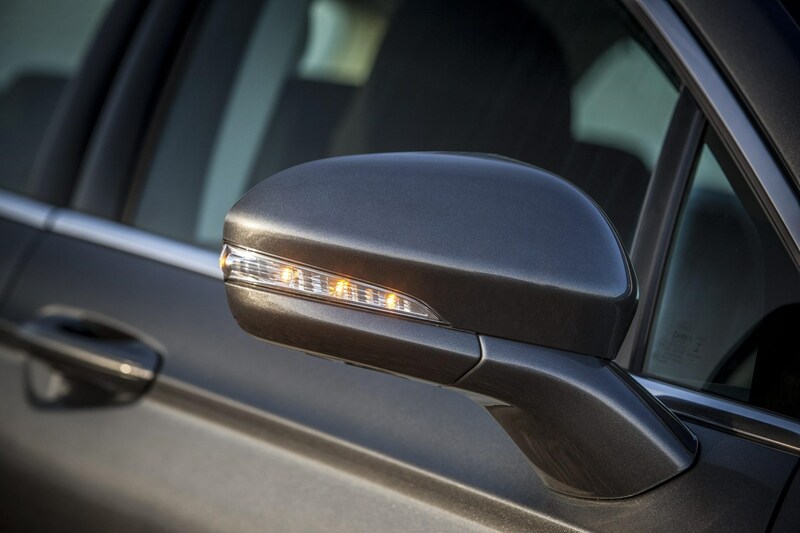 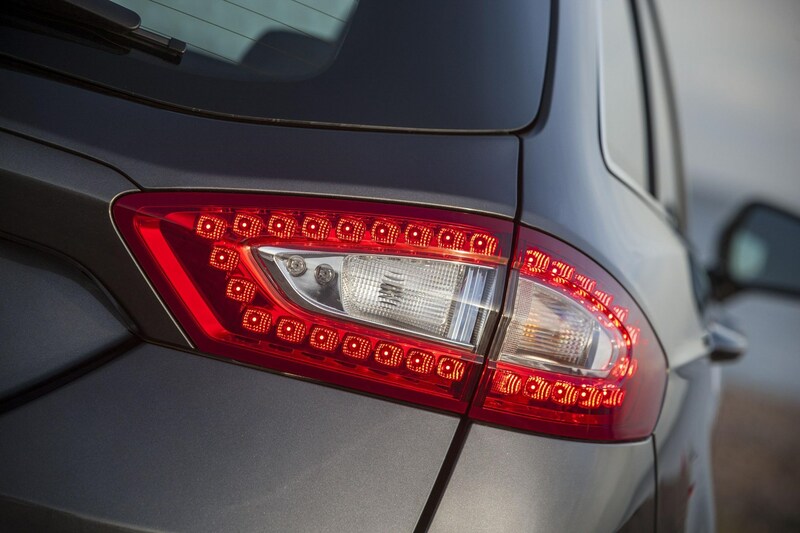 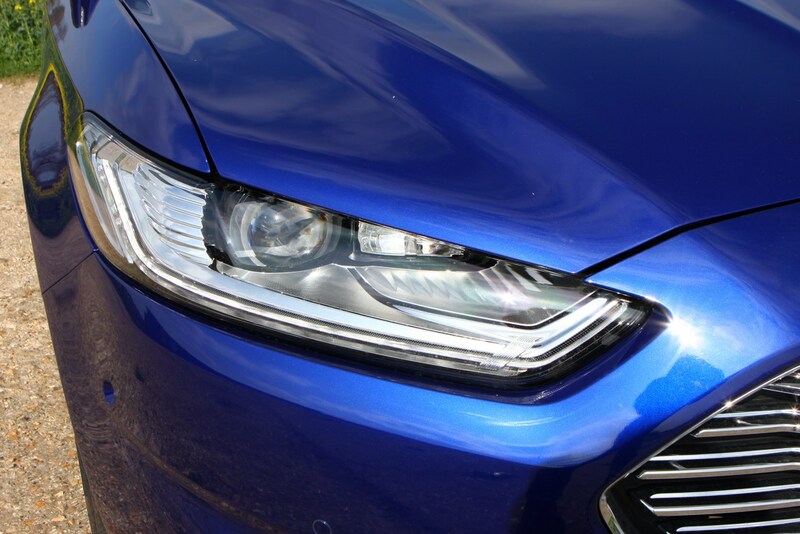 Other new tech included optional LED headlamps, which bend light around corners, and incorporate a thin LED day running light with integral pulsating (rather than flashing) front indicators. 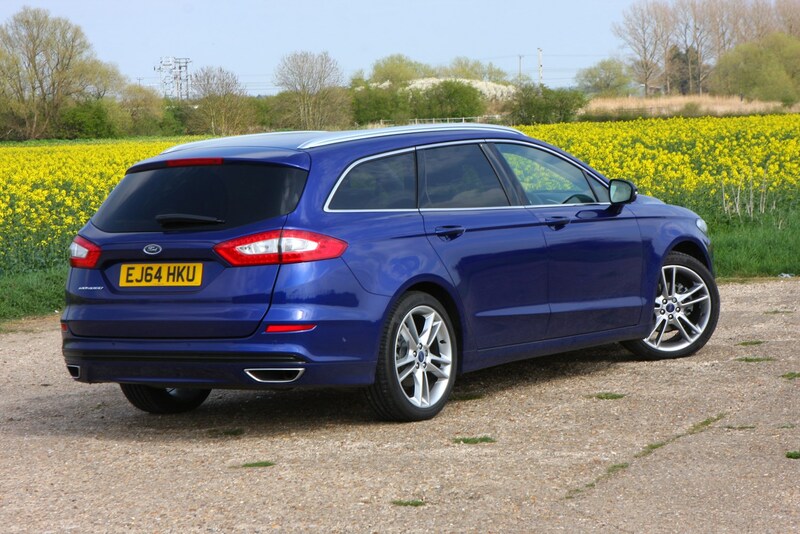 The Mondeo Estate’s self-parking function would now parallel park the Ford, rather than just reversing into bays. 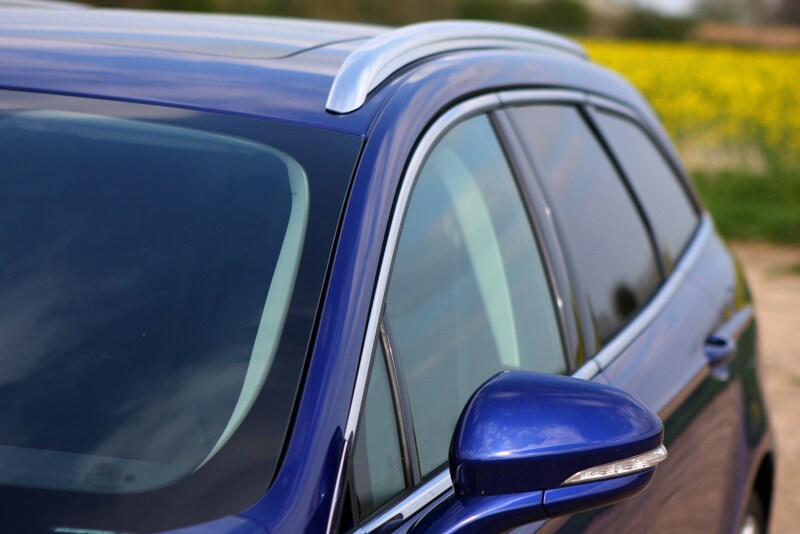 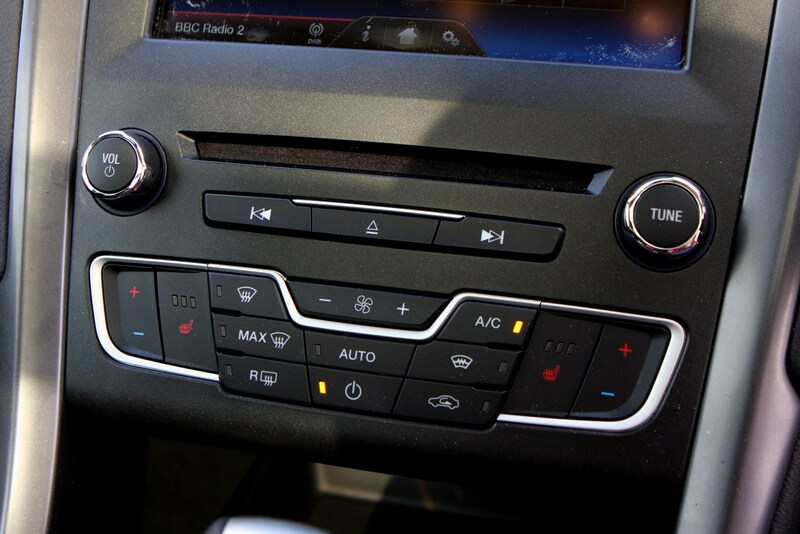 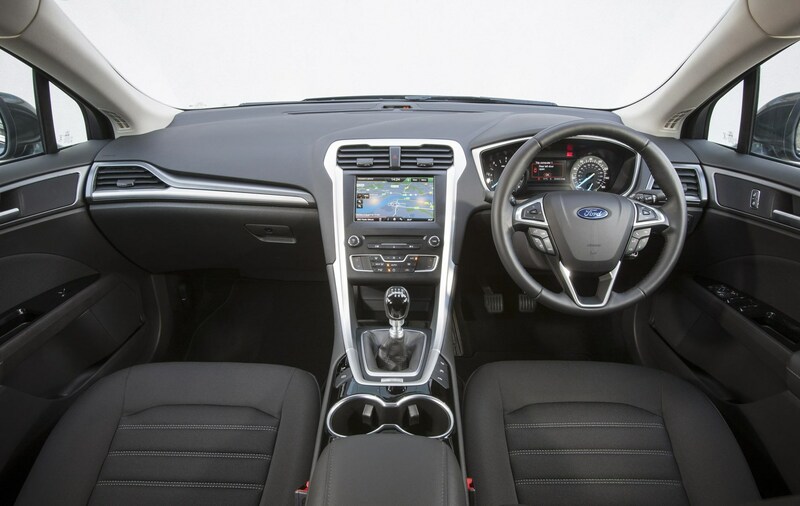 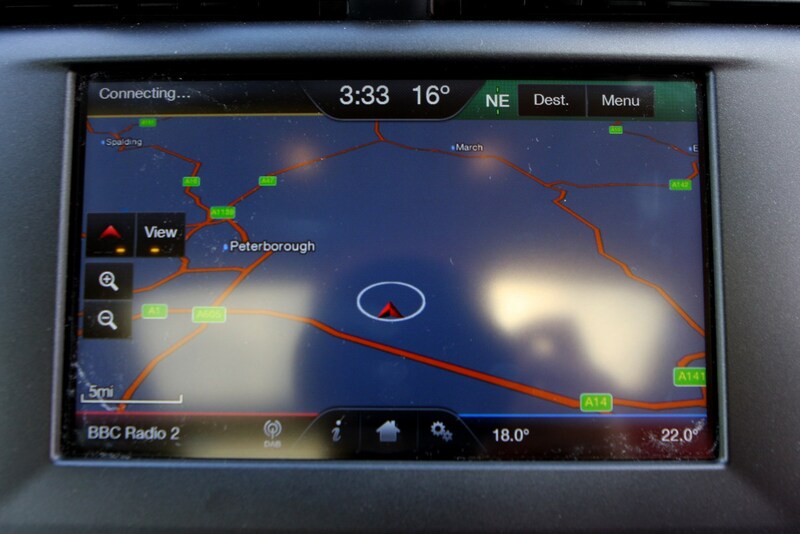 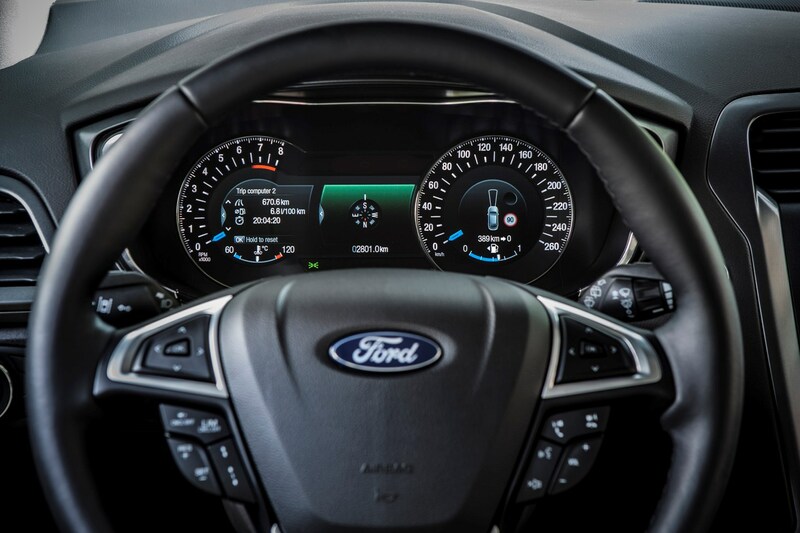 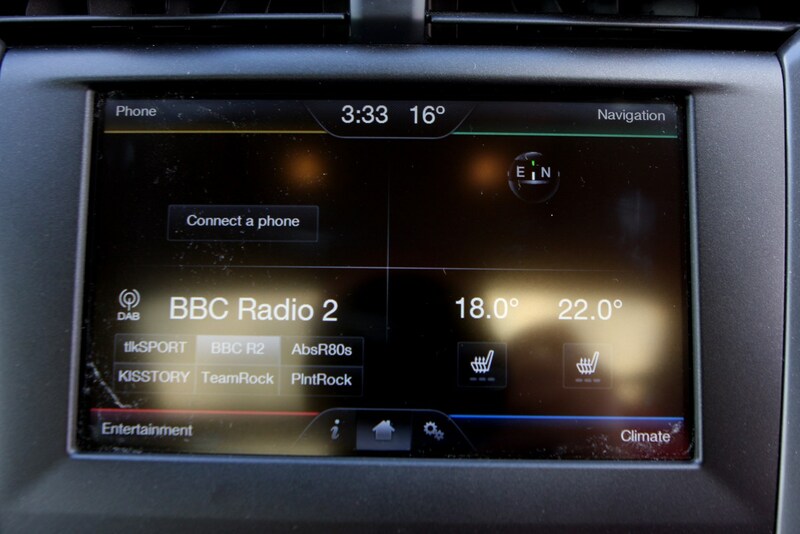 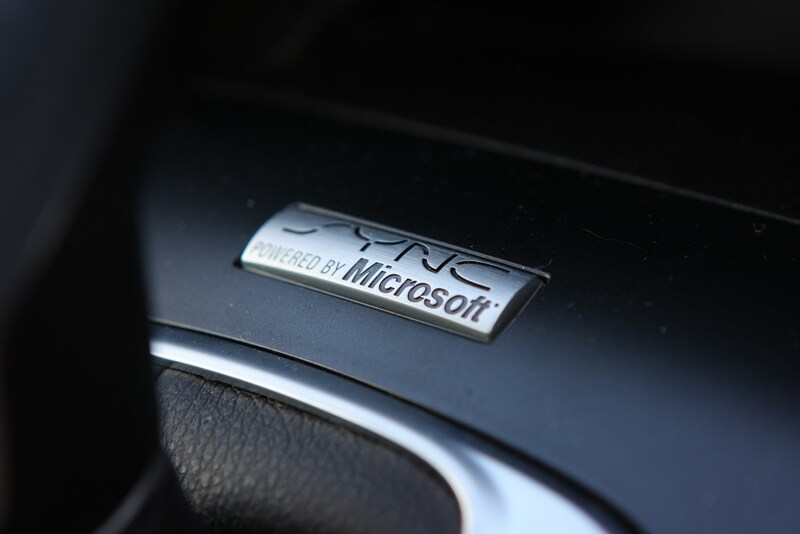 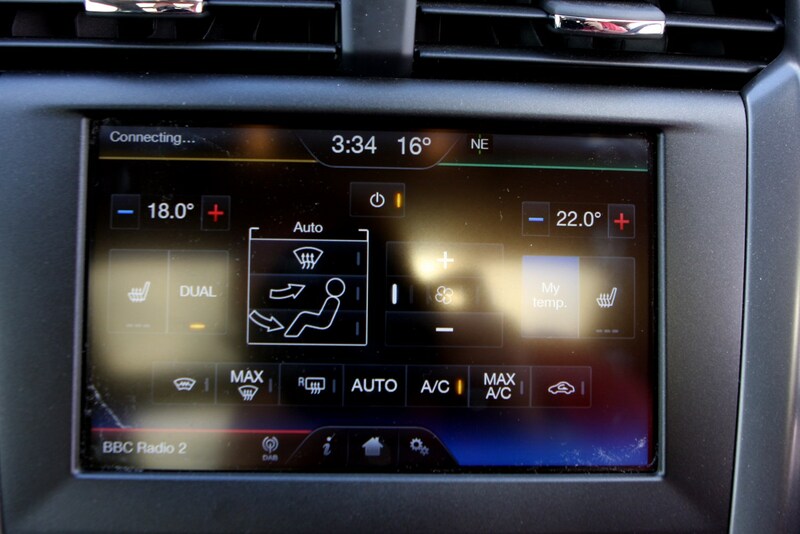 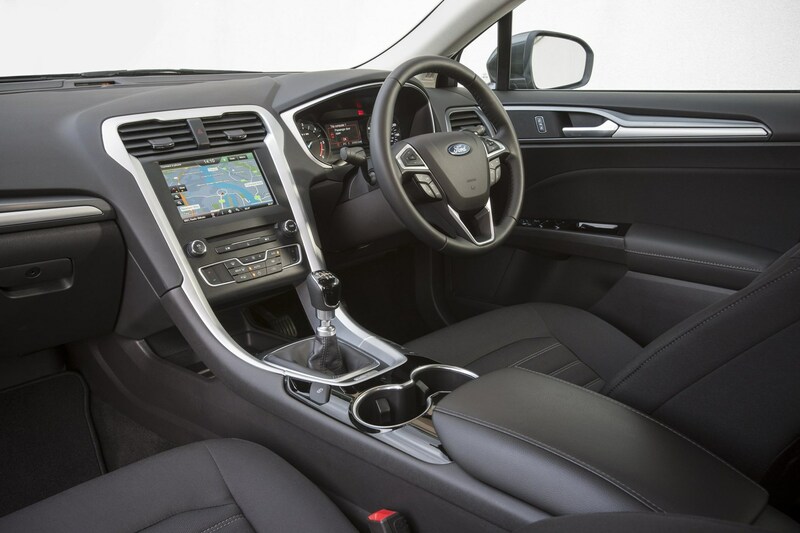 Whichever trim level of Mondeo Estate you went for, it was fitted with an 8.0-inch colour touchscreen for the Sync2 infotainment system – which was jointly developed with Microsoft, so it’s easy to use. 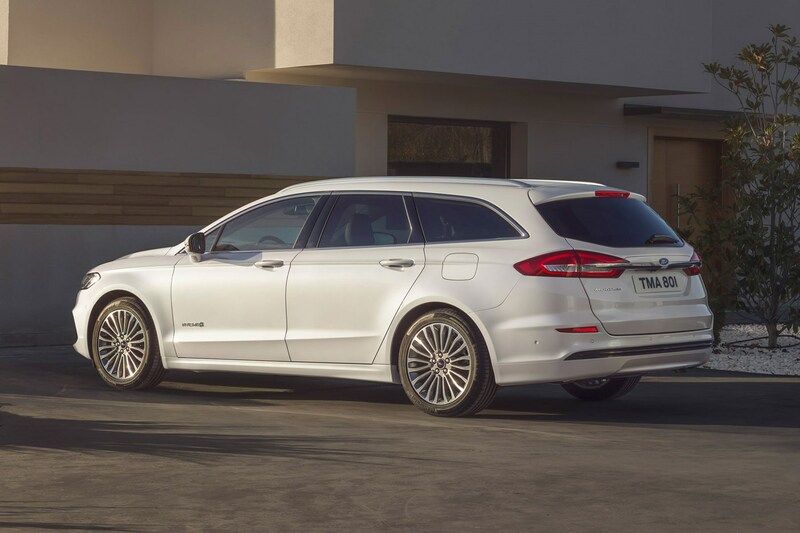 While the Mondeo Estate’s main rival, Volkswagen’s Passat Estate, comes with a petrol-electric hybrid powertrain option called GTE, diesel and petrol motors exclusively powered the Mondeo Estate, the former accounting for 90% of sales. 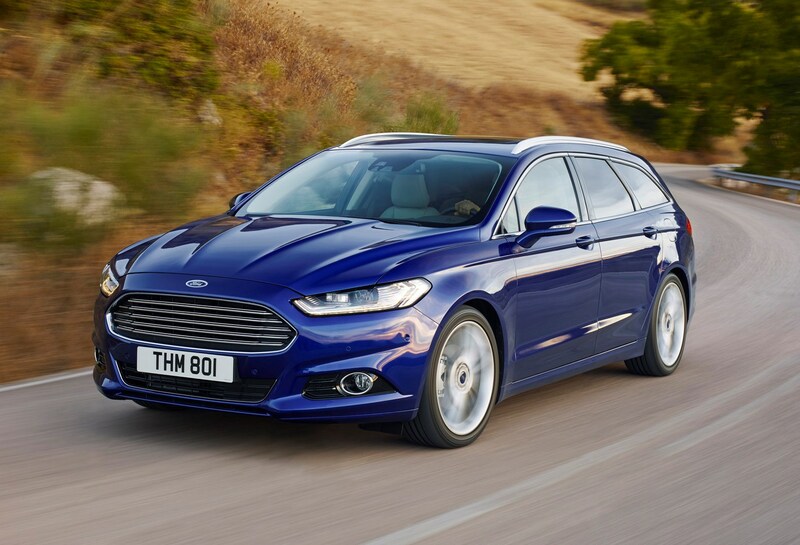 On sale from the end of 2014, the diesel line-up initially comprised of the 1.6-litre TDCi with 115hp and a 2.0-litre TDCi producing 150hp. 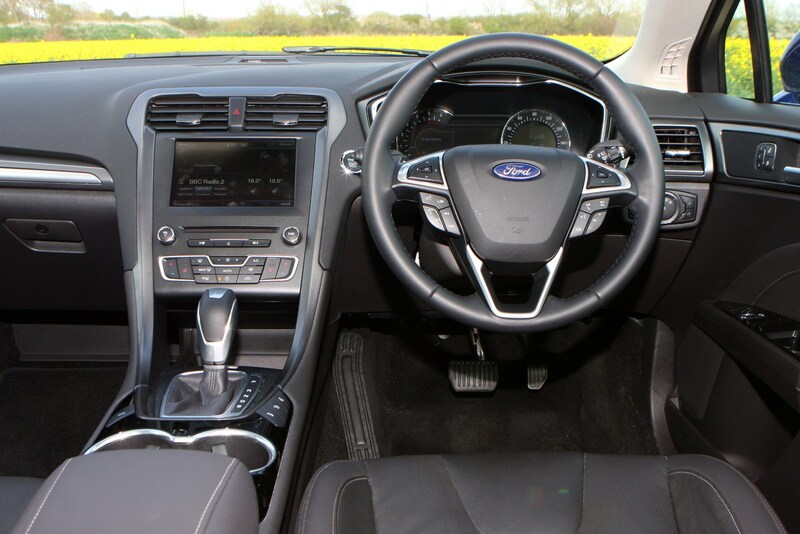 Econetic fuel-saving technology and a six-speed manual gearbox was fitted to both, although the larger engine was also available with Ford’s PowerShift automatic transmission. 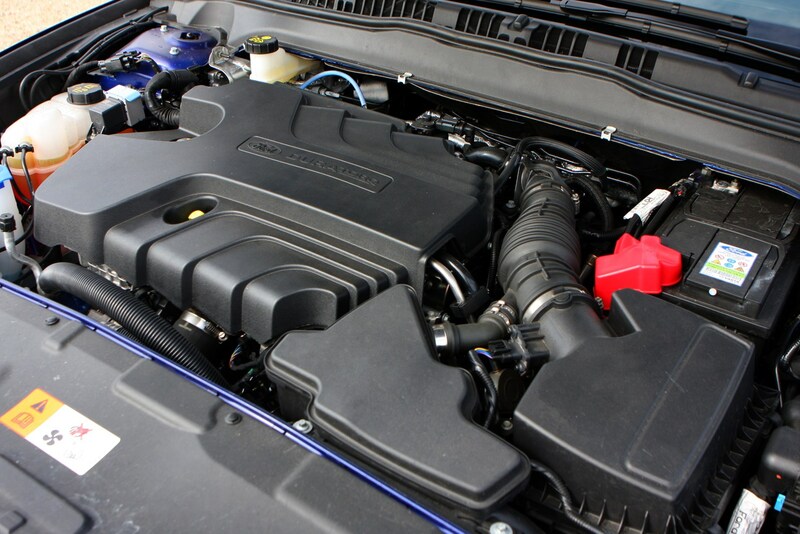 There was also a 180hp version of the 2.0-litre engine, with both transmissions available. 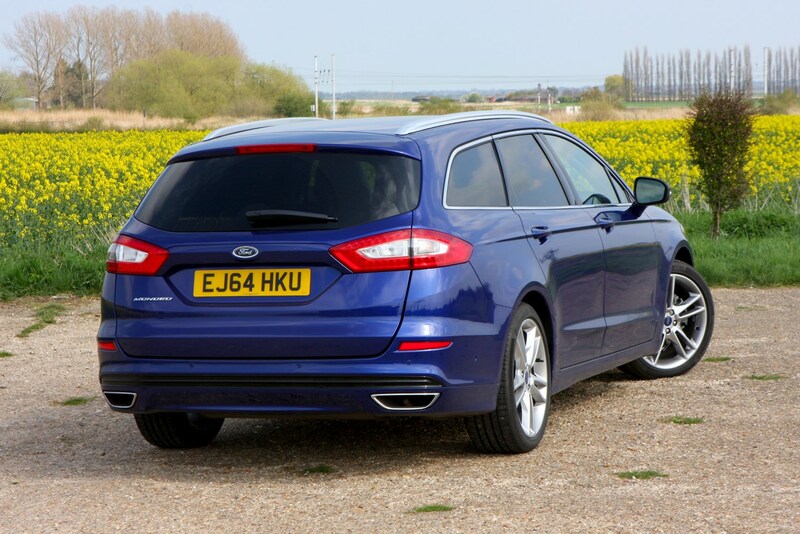 It was the 1.6-litre diesel to go for if economy’s your primary concern, with Ford claiming figures of 74.3mpg and CO2 emissions of 99g/km in the Mondeo Estate at the time – though these figures were measured before the new WLTP fuel economy and emissions regulations came into effect, so they’ll be worse if retested now. 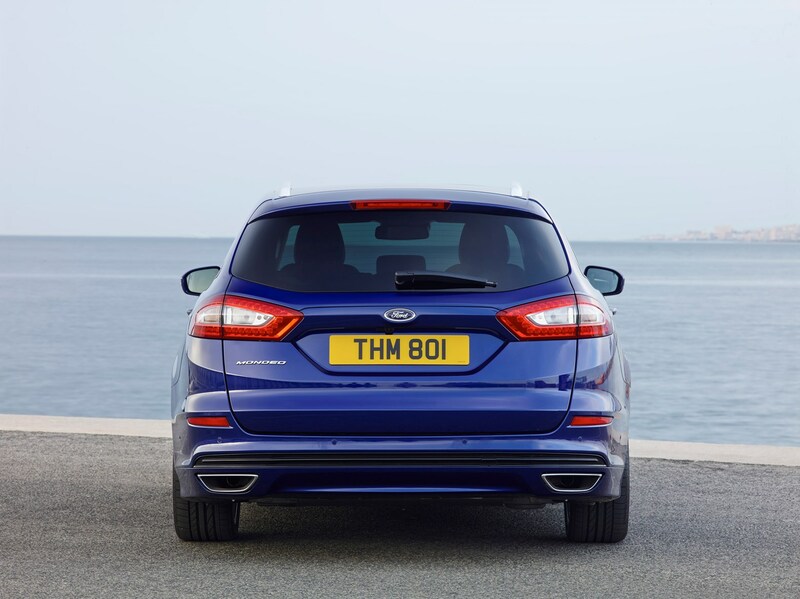 In spring 2015 a 120hp 1.5-litre TDCi, four-wheel drive versions of the existing 2.0-litre TDCis, and a range-topping 210hp edition joined the line-up. 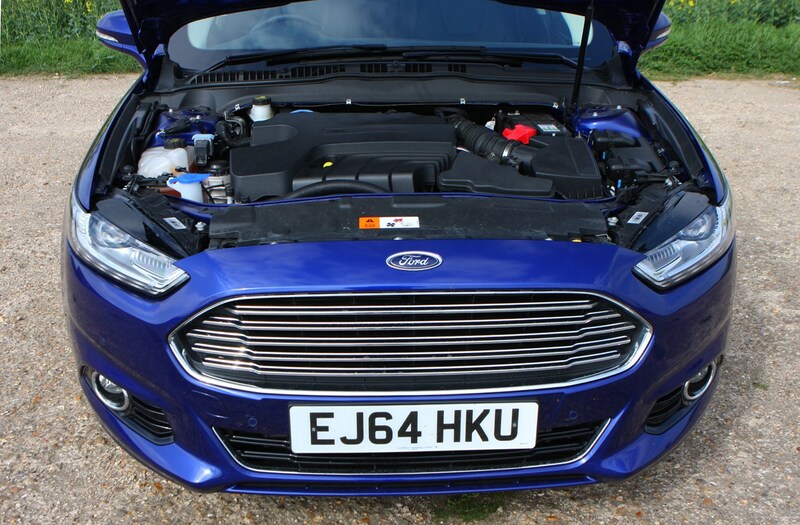 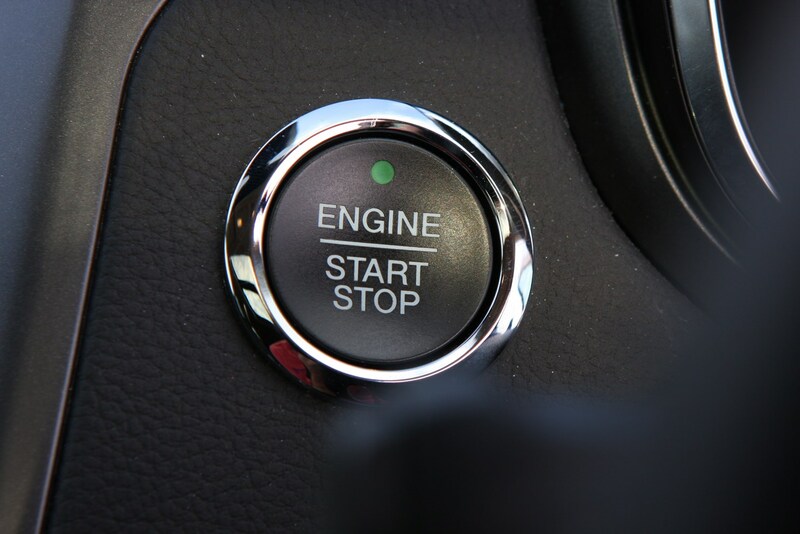 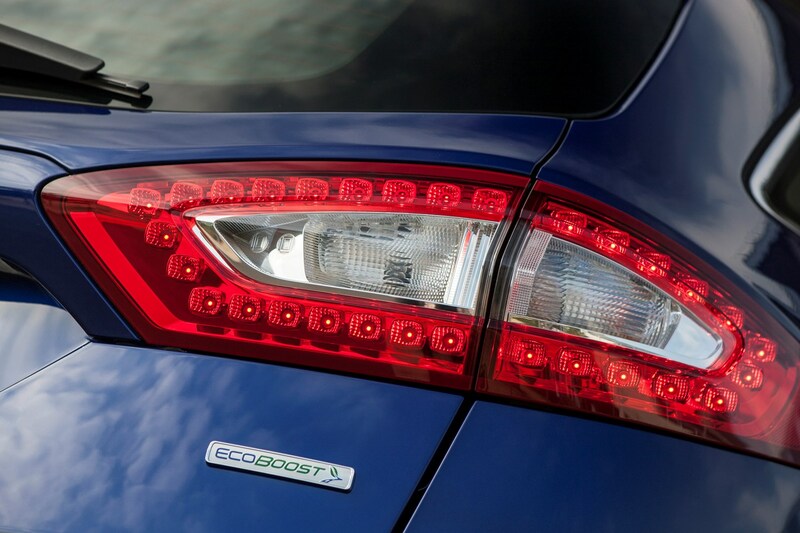 Petrol fans had the choice between a 160hp 1.5-litre EcoBoost in Zetec trim upwards, or if you went for a Titanium model the 240hp 2.0-litre EcoBoost. 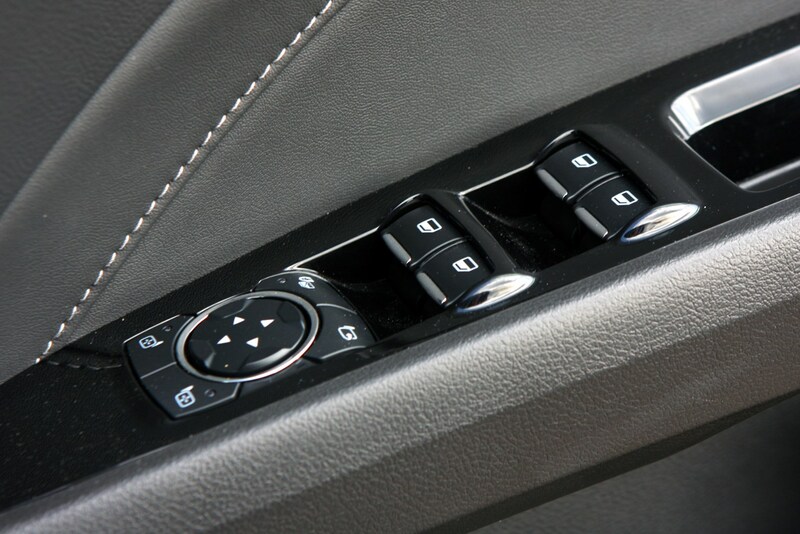 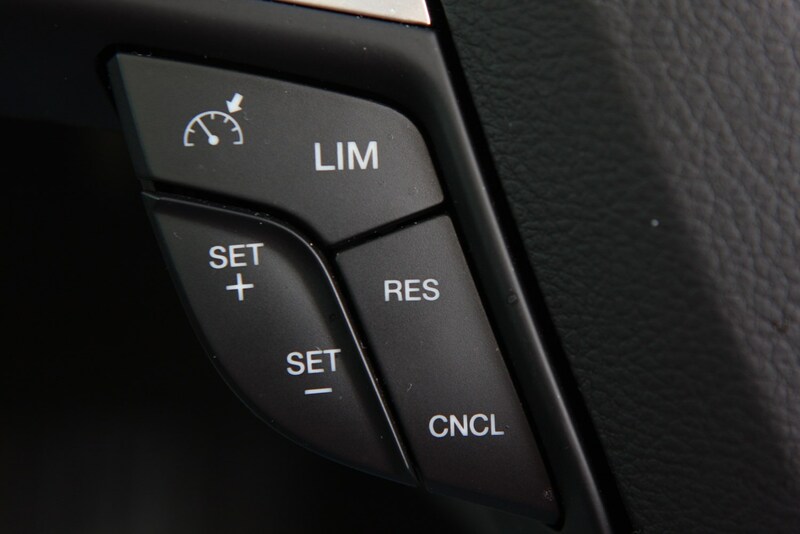 The former’s available with six-speed manual and automatic gearboxes, the latter in automatic-only form. 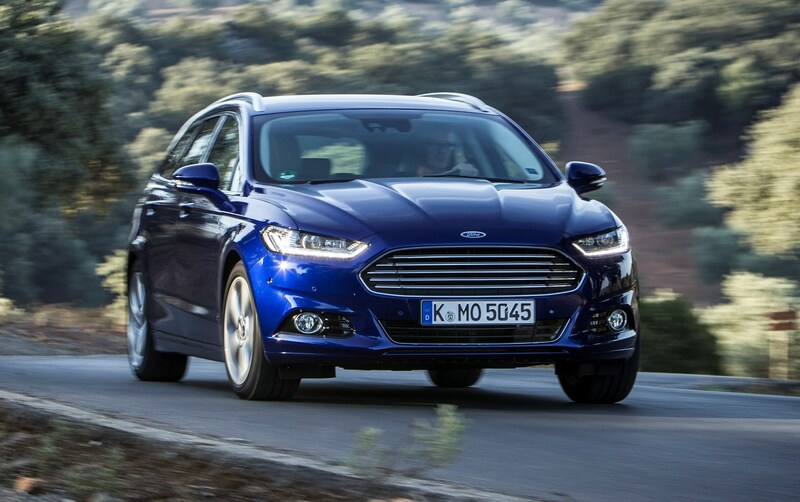 There was also a 125hp, three-cylinder 1.0-litre EcoBoost that joined the petrol offerings in spring 2015. 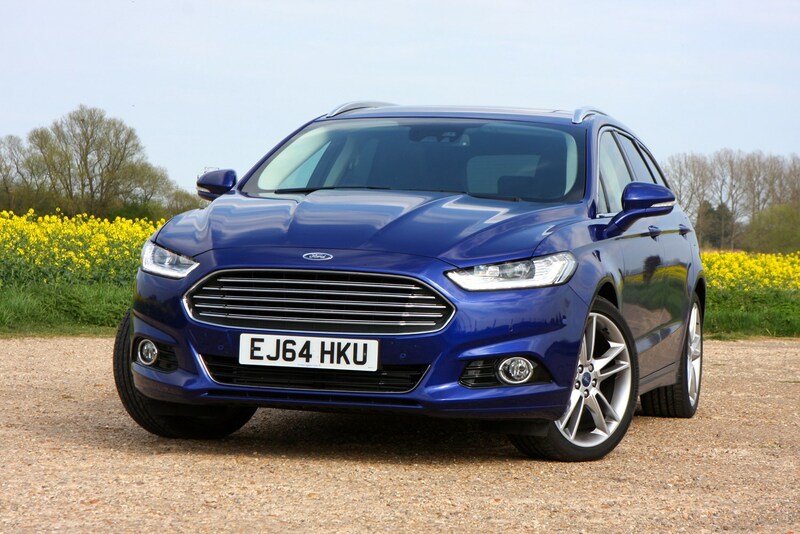 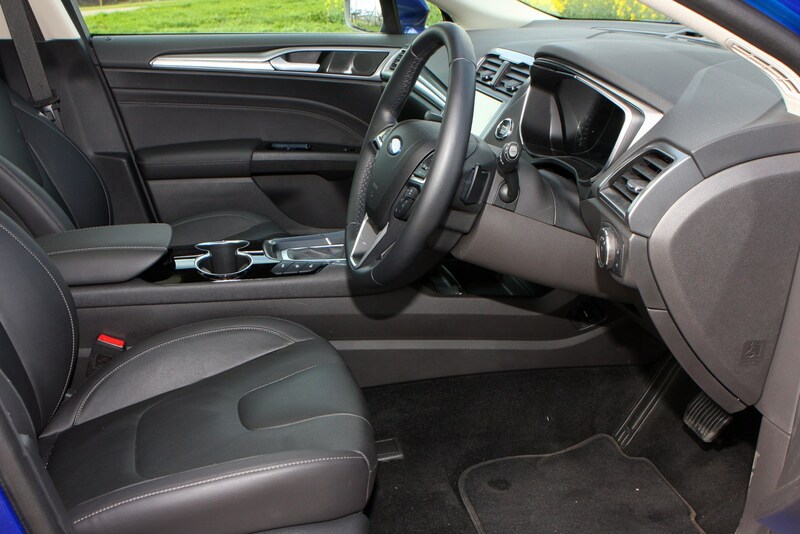 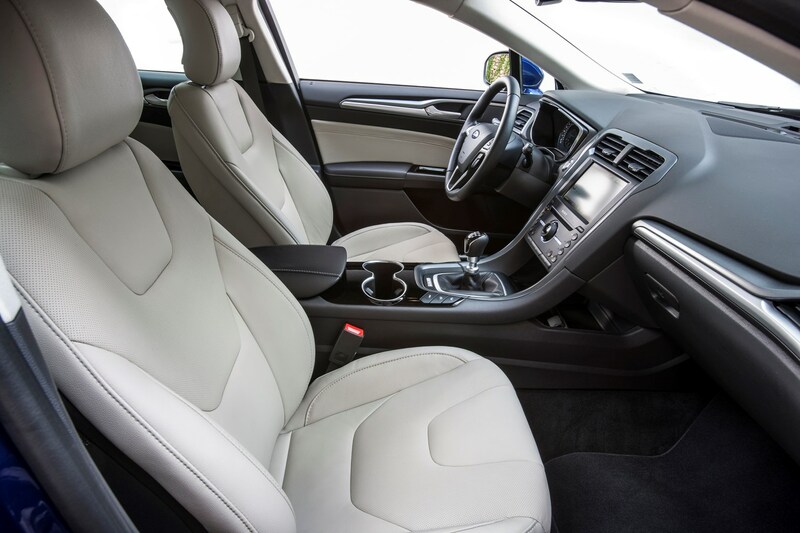 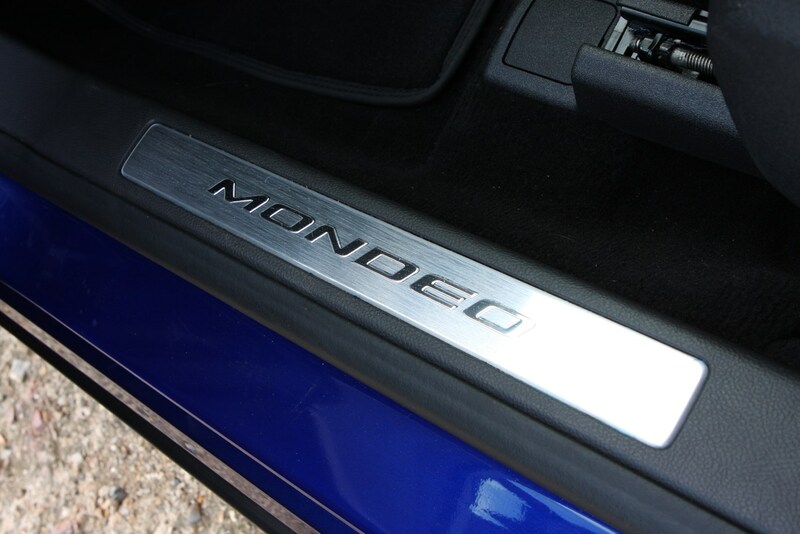 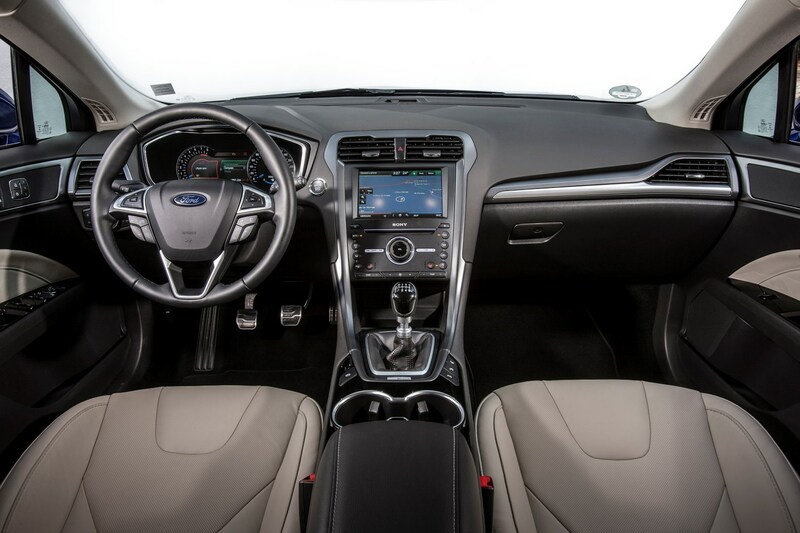 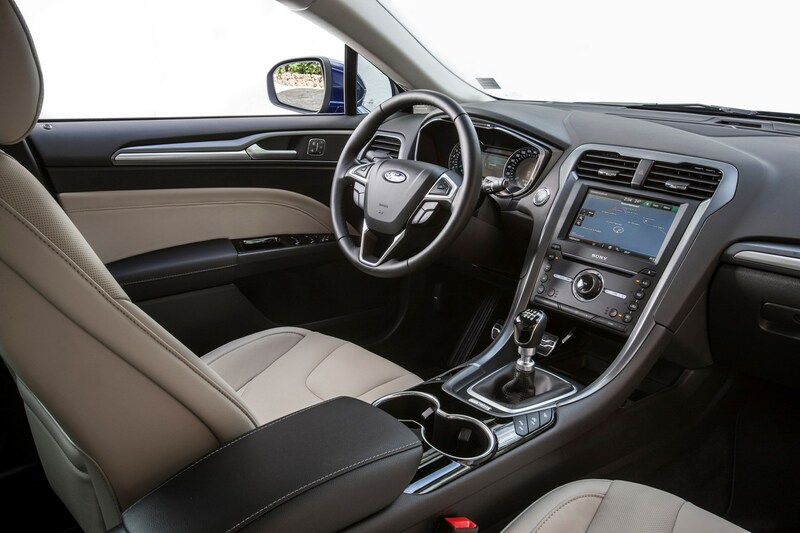 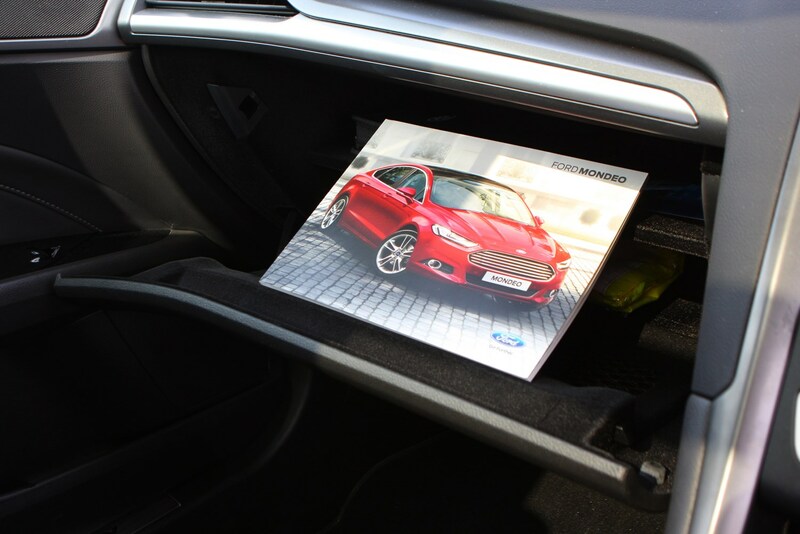 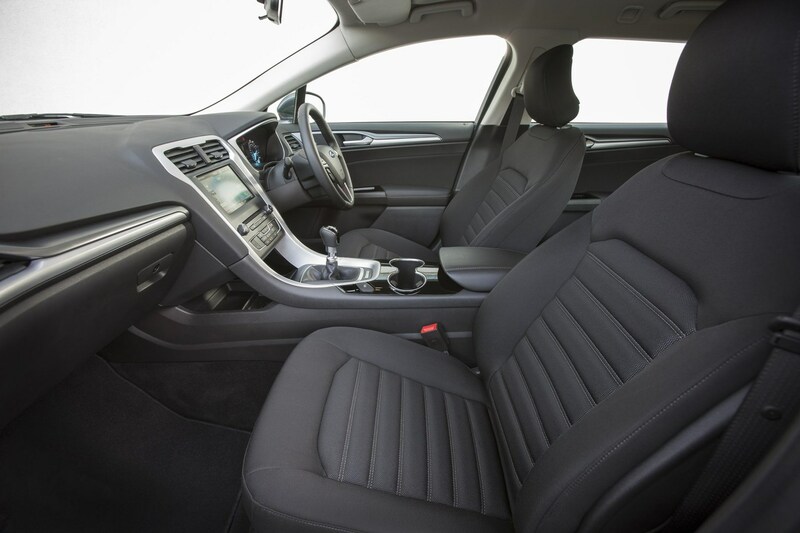 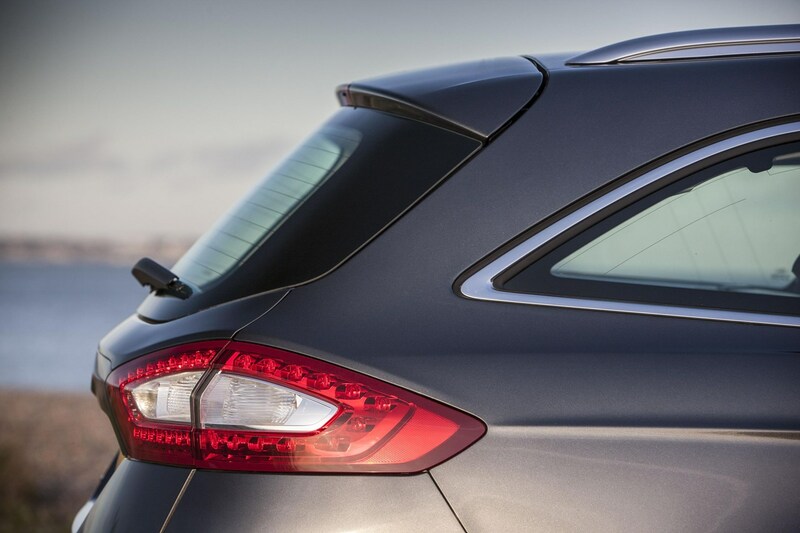 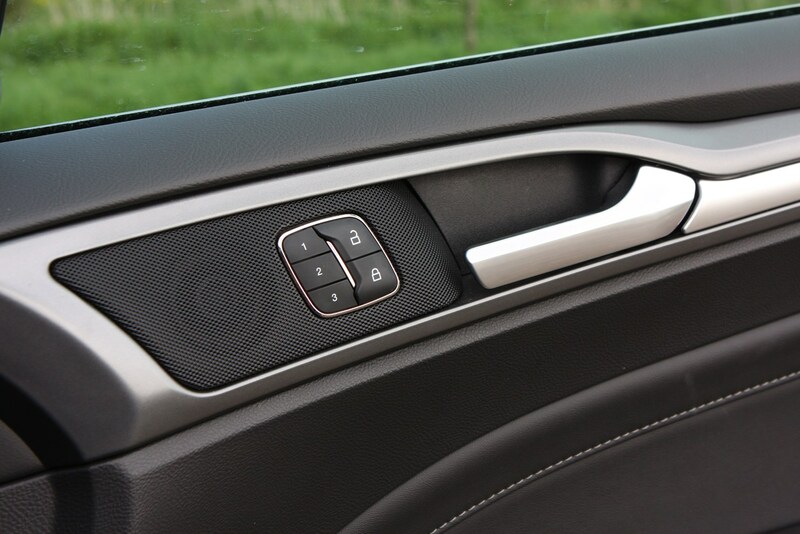 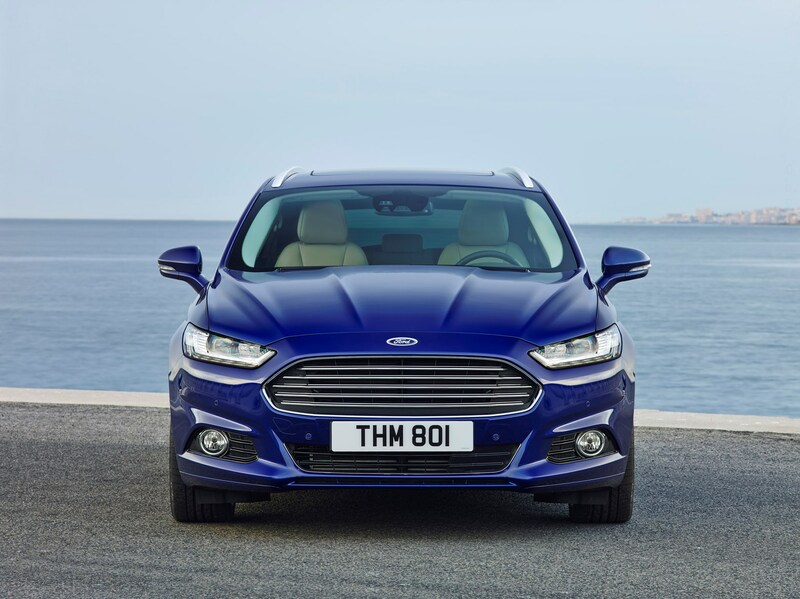 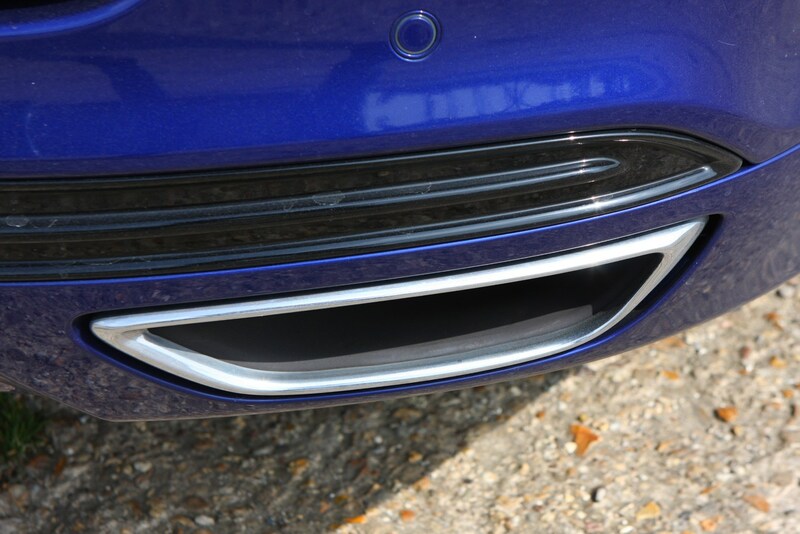 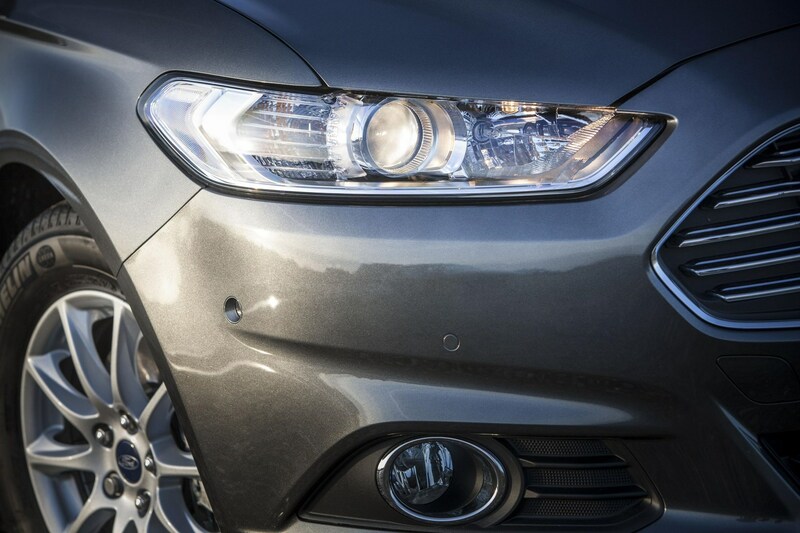 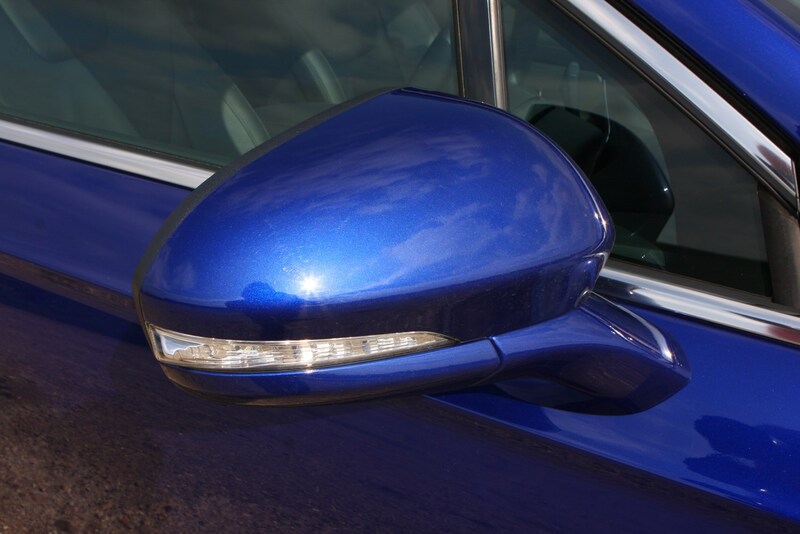 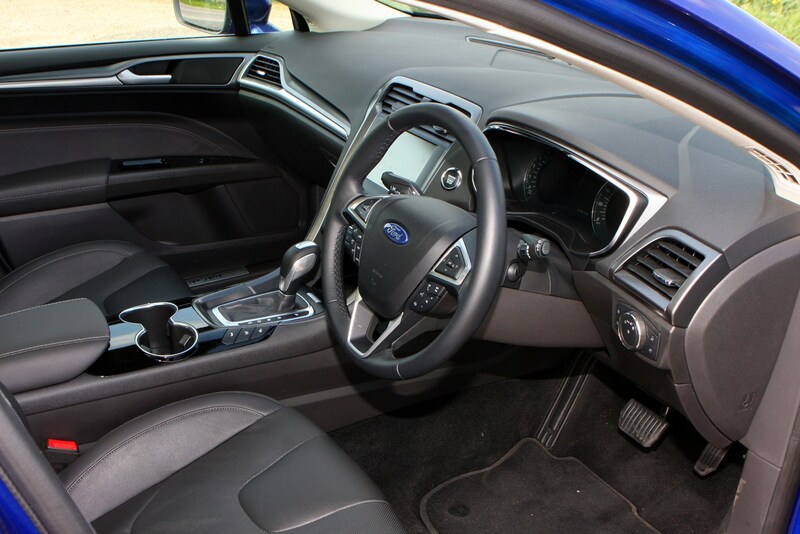 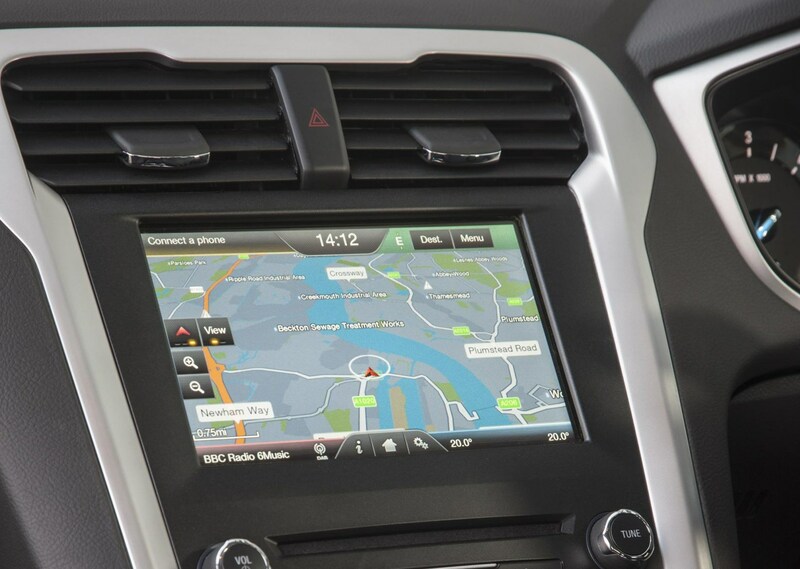 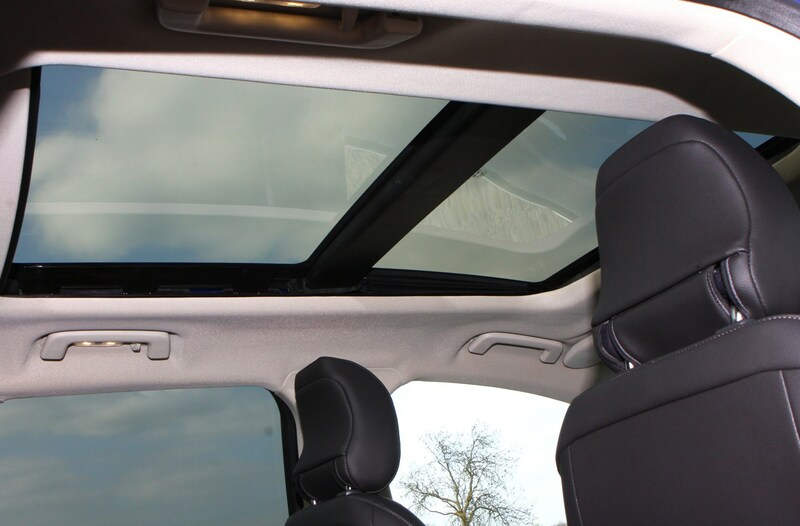 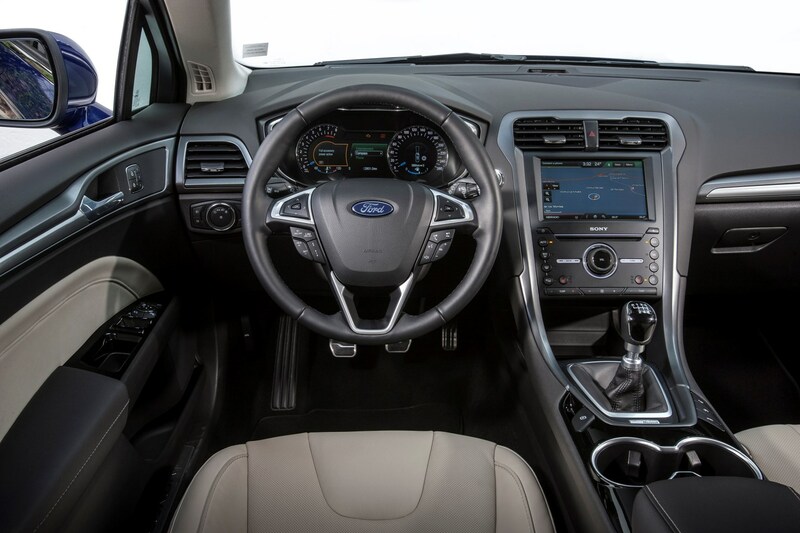 What’s the 2014-on Ford Mondeo like inside? 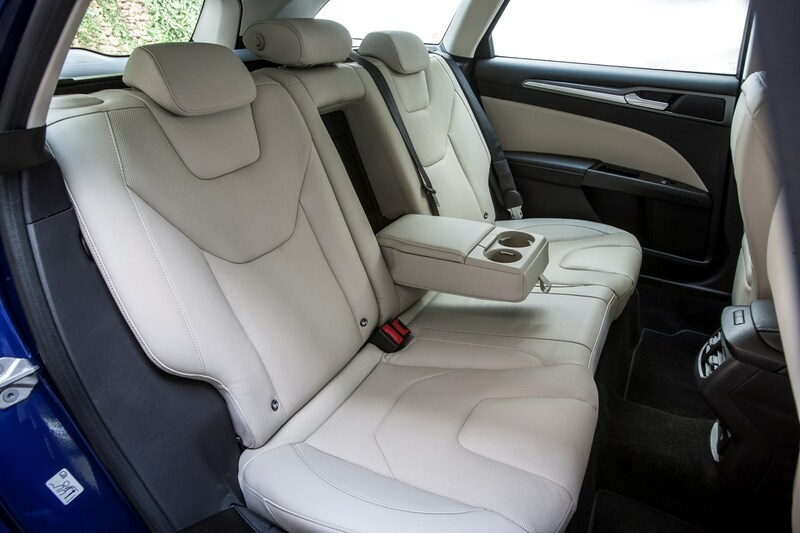 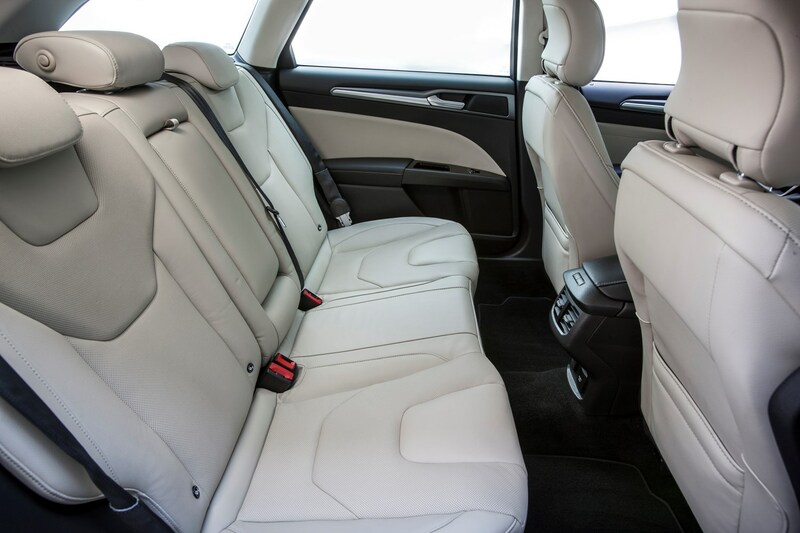 There is plenty of space for five adults, it’s comfortable and the ride is impressive. 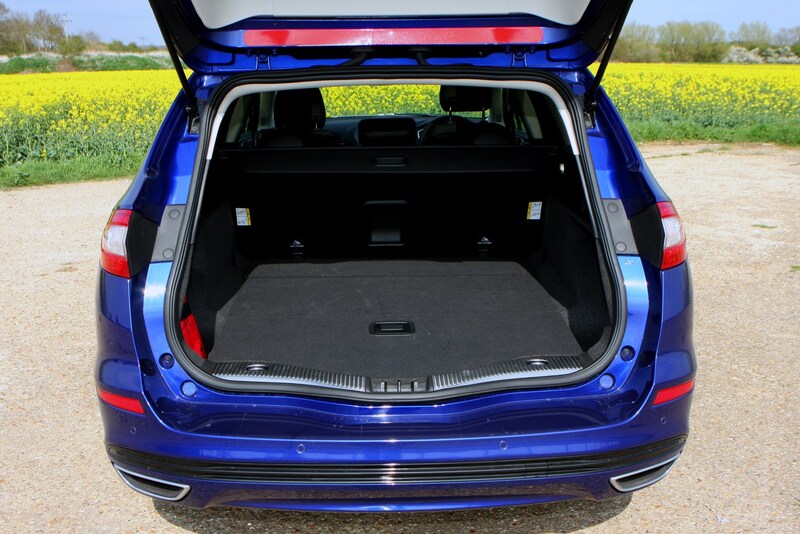 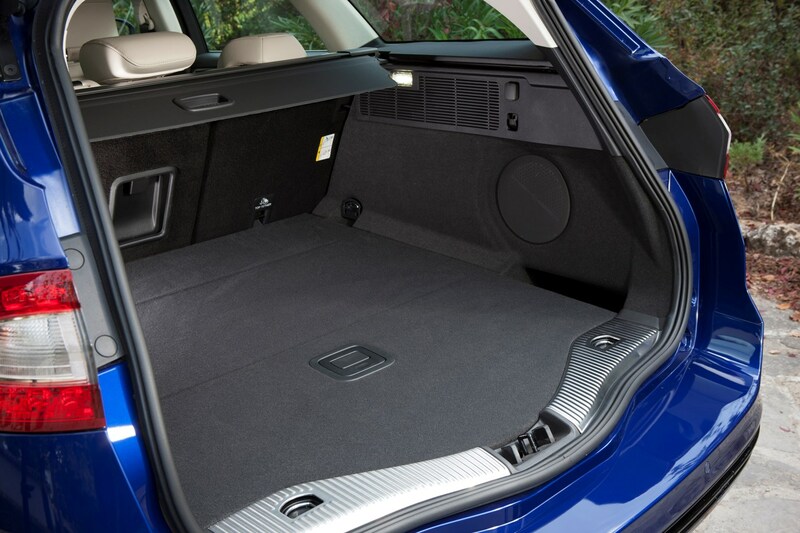 Boot space at 500 litres fails to match the Passat Estate’s 650 litres, and it’s not down to a full size spare wheel taking up space either. 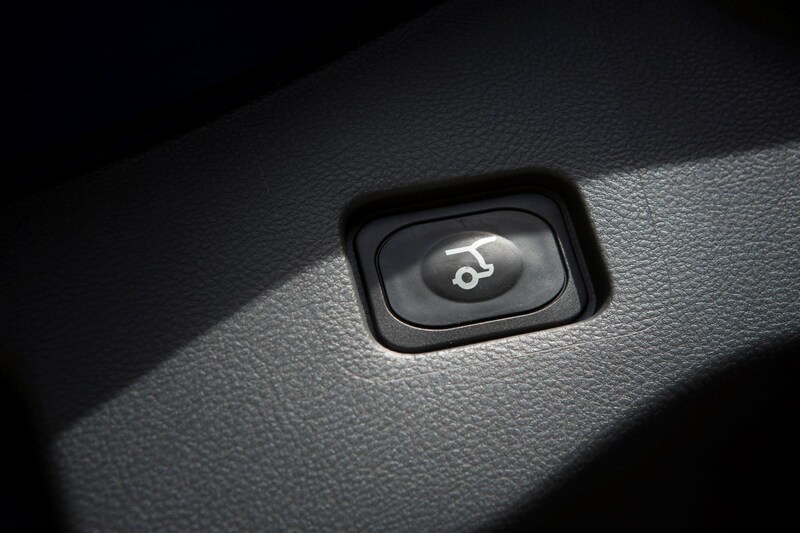 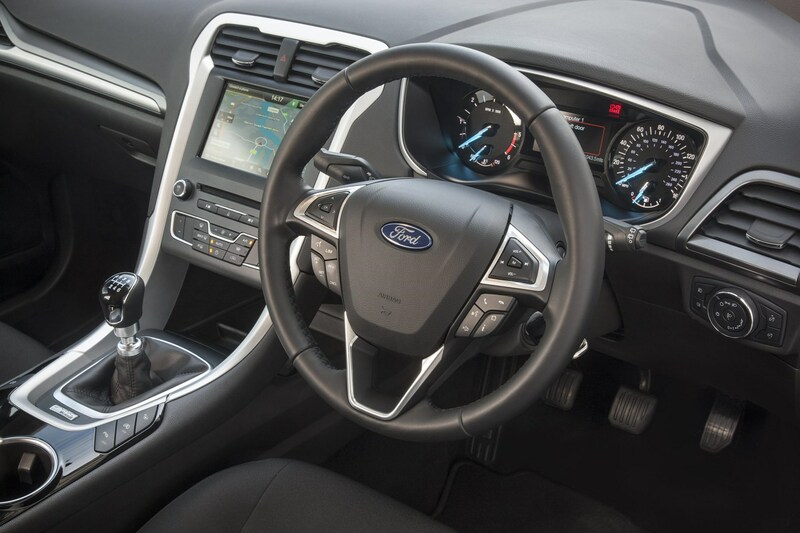 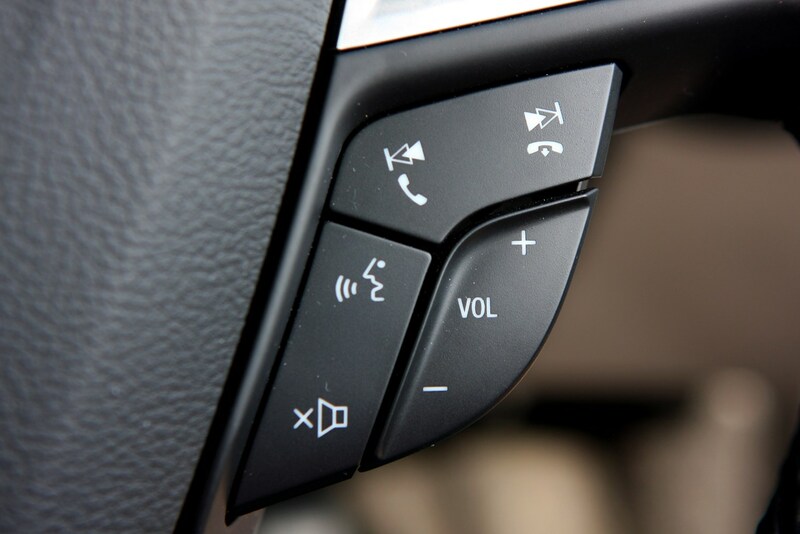 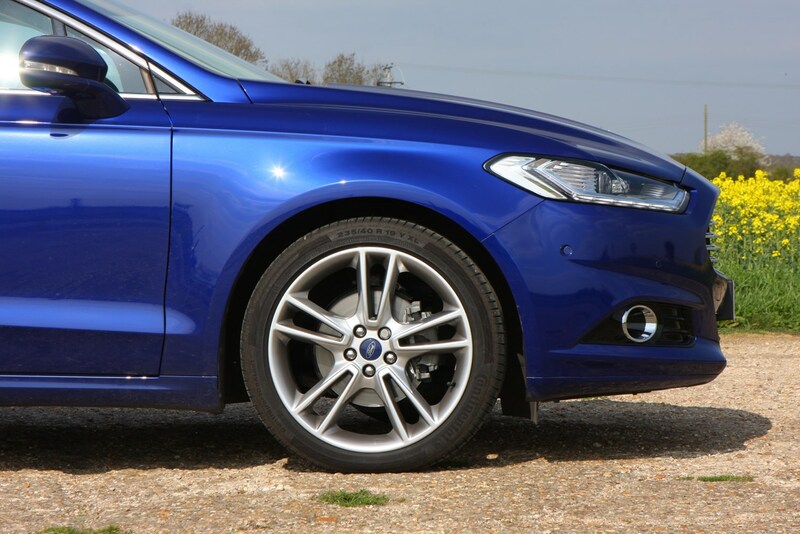 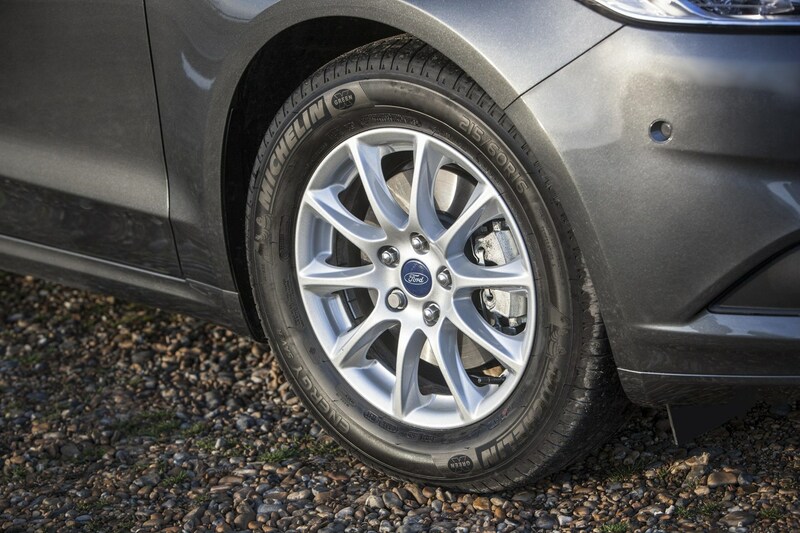 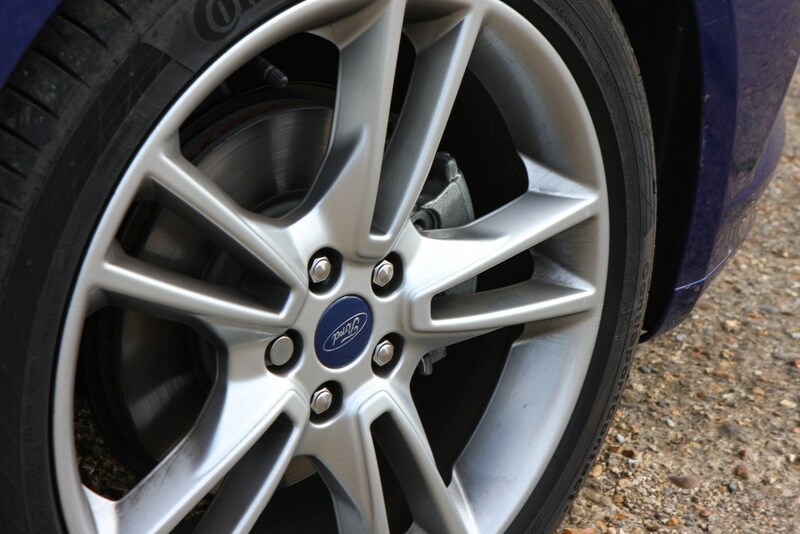 The Mondeo features a space saver wheel as standard. 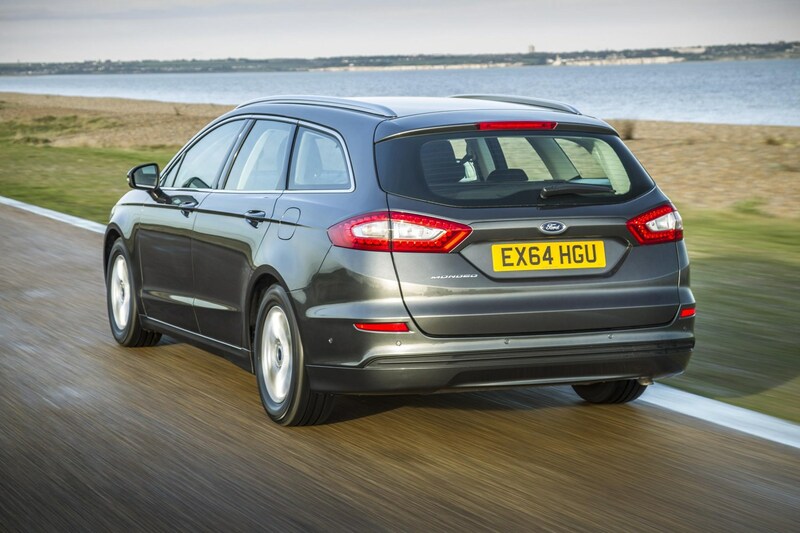 Past Ford Mondeo buyers may be disappointed the latest generation is not as engaging to drive, although it does remain composed and surprisingly nimble. 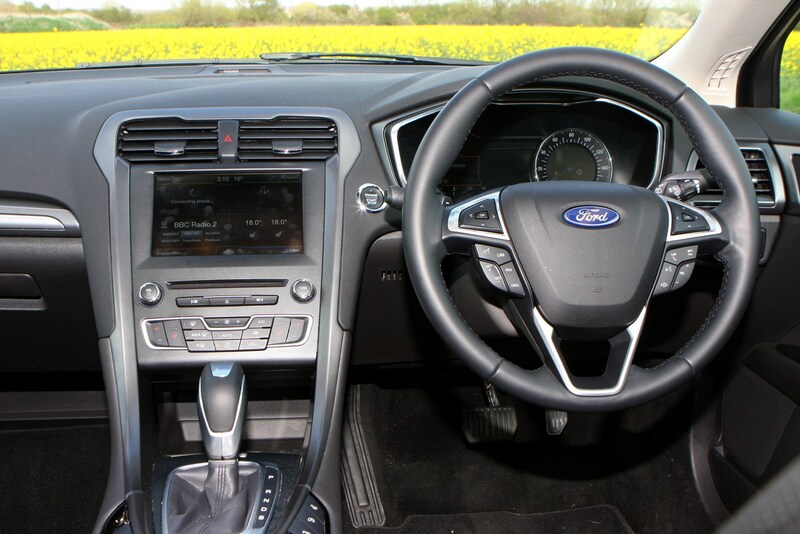 It's also very relaxing and refined, with a spacious interior and lots of equipment available. 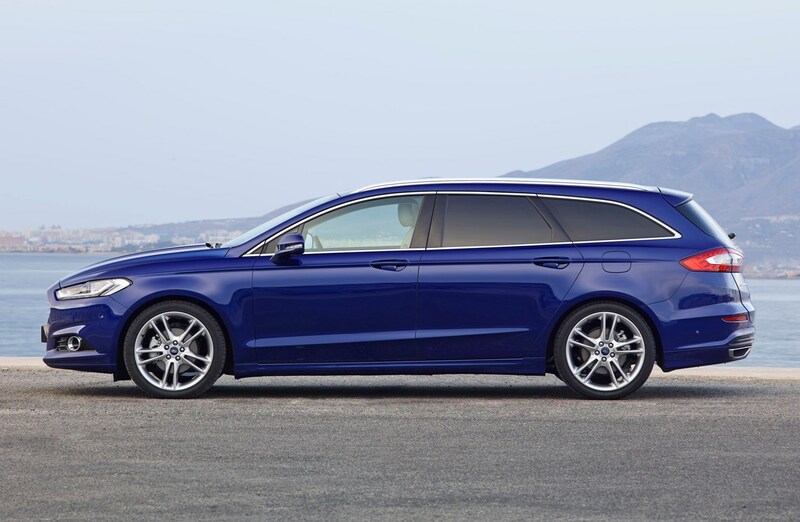 The 2019 facelift should keep things a little more up to date, too.